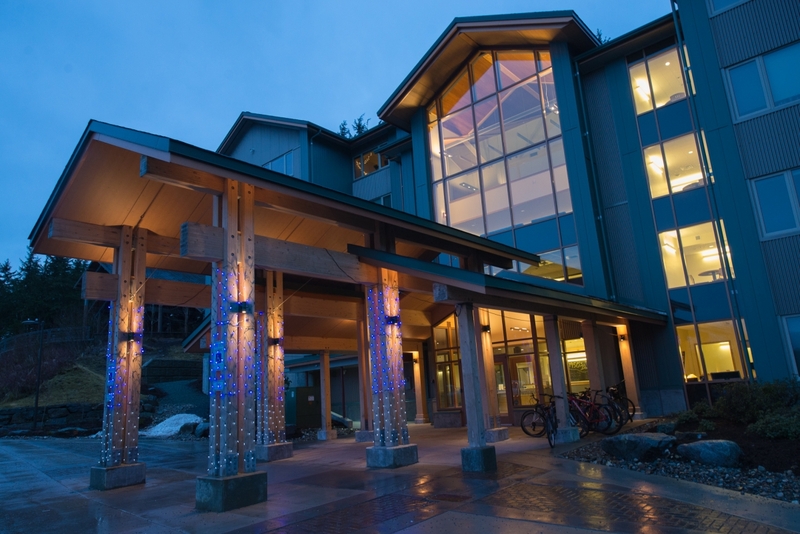 The lighting design criteria for this project was to design a pleasant inviting environment that did not feel institutional. 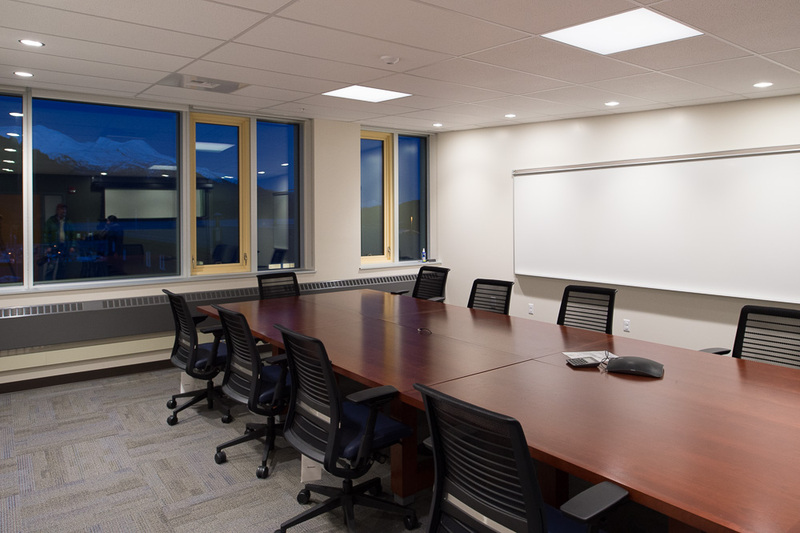 Controls for lighting throughout utilized occupancy sensors and with or without dimming control, to meet occupants desired light levels. 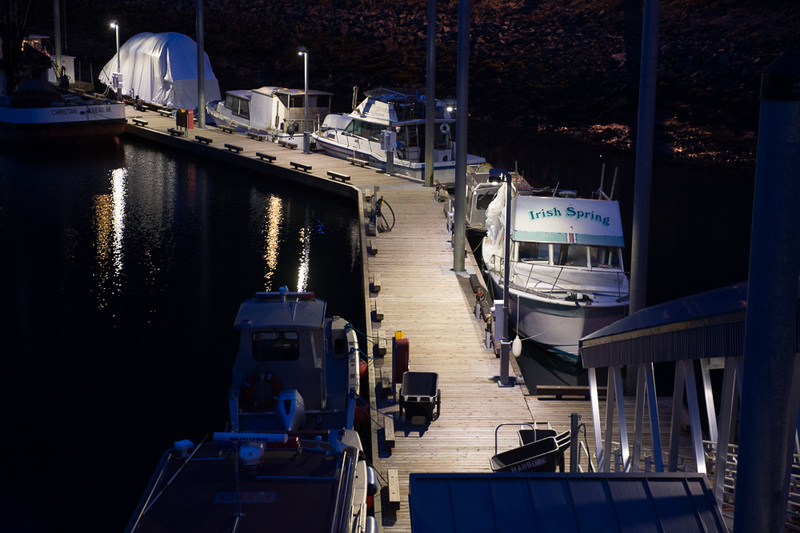 The exterior lighting brings a nautical appearance using Red and Green LED wall sconces illuminating the entry. 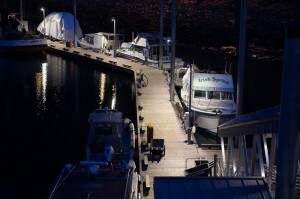 The Flag is illuminated from above with small LED accent flood lights. 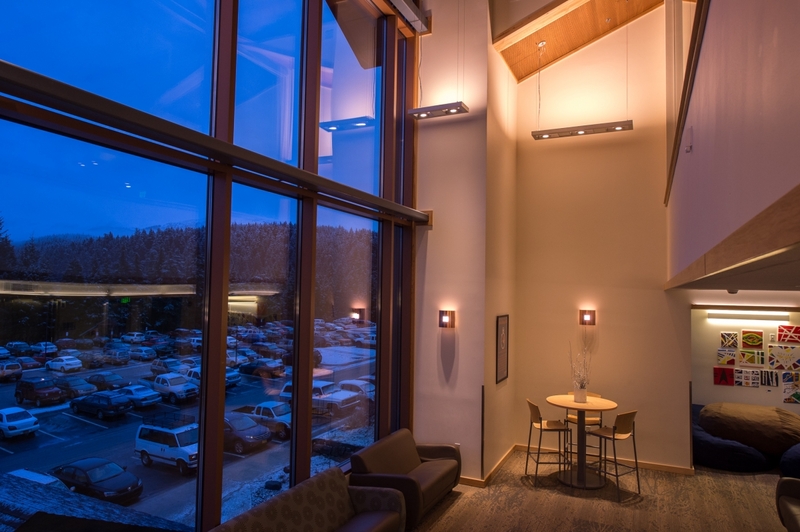 The interior stair tower provides a warm glow using LED wall sconces. A lamp temperature of 3000K was used to help bring out the warmth. 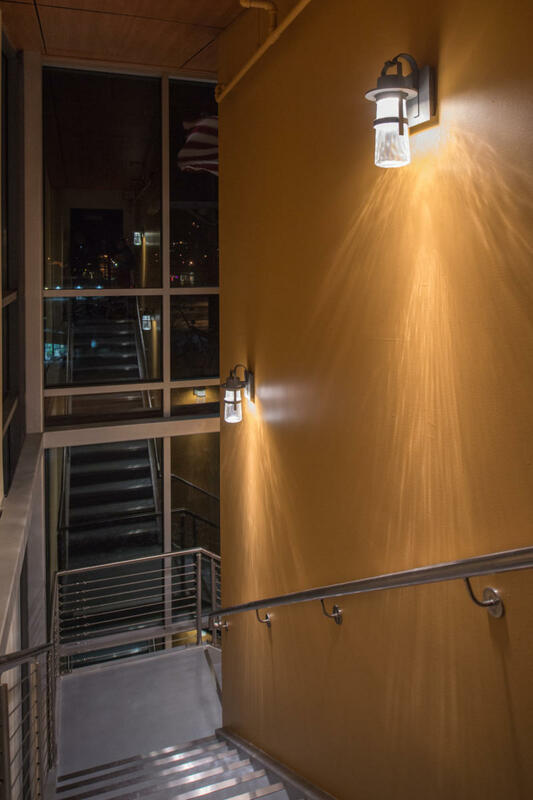 The interior stairwell is illuminated with LED wall sconce using a warm 3000K lamp with a CRI of 90. The flexible decorative ceiling mounted track in the corridors provides ample lighting for the walkway as well as illuminating art work on display. The small track heads are low voltage LED, a frosted shade. 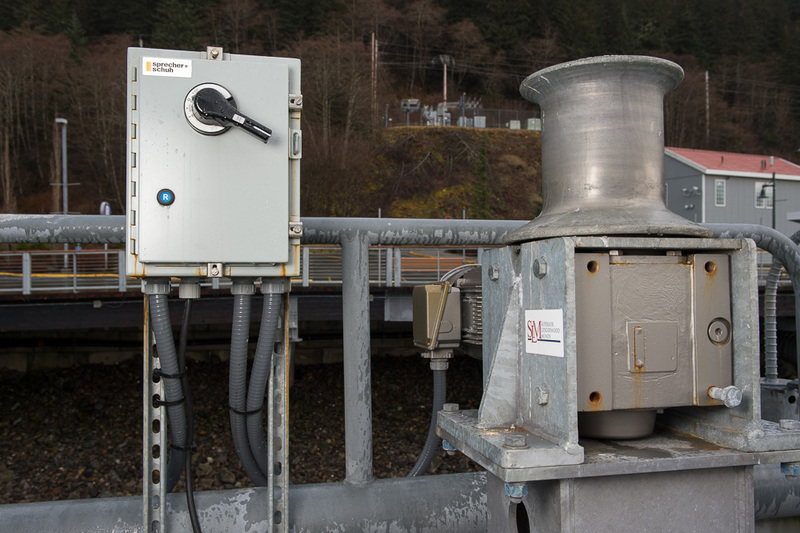 A remote transformer provides power to the decorative track. In the conference room pendant mounted linear LED luminaires provide even illumination of the conference table. Dimming controls are provided to make the space flexible for multi-use. Undercabinet lighting using linear LED strip is provide at the coffee bar. 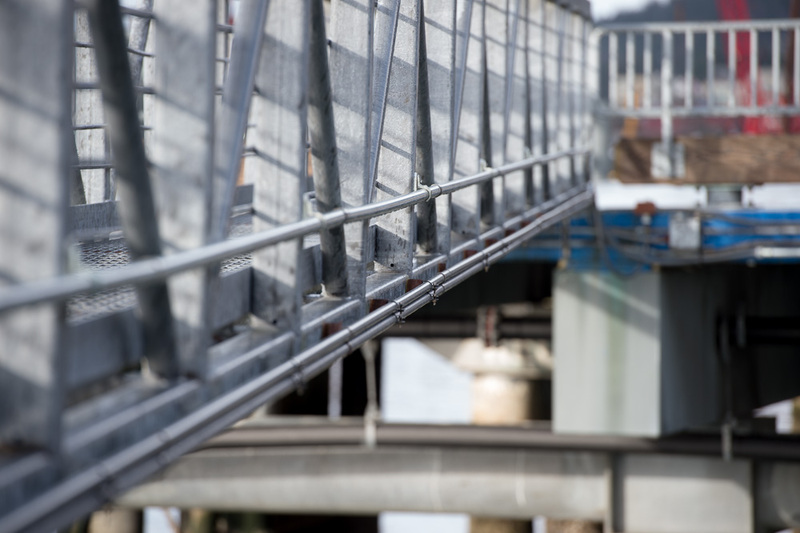 In 2012 HAI provide professional design documents including utility service and distribution systems to the docks, raceways, trays, vaults. 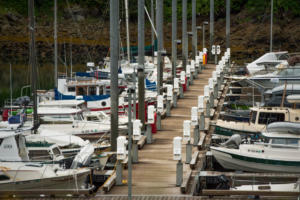 Also, future installation of shore power service to the vessels including the stationary docks, ramps, and floating docks. 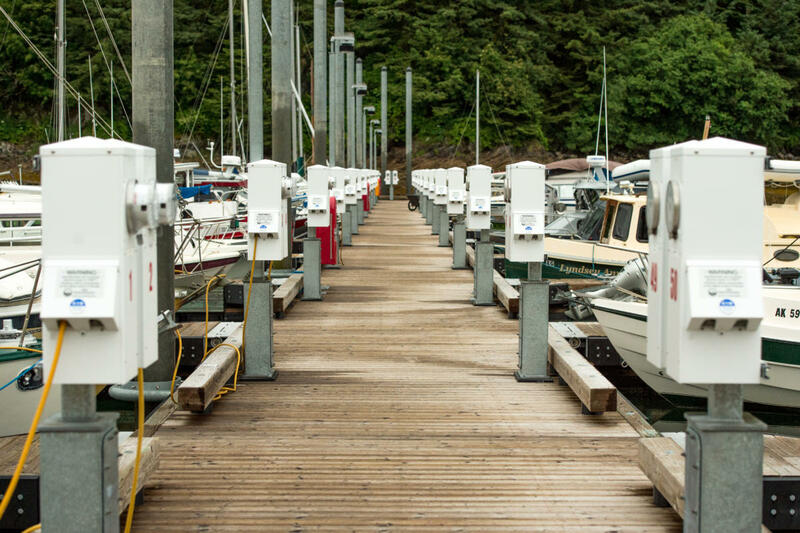 HAI designed power for capstans and pumps, maintenance power, power and communications for waste water instrumentation, capacity to provide winter moorage shore power to smaller vessels, lighting on the ramps and floating docks, and on the stationary docks, Surveillance cameras and power and communications for security gate facilities. 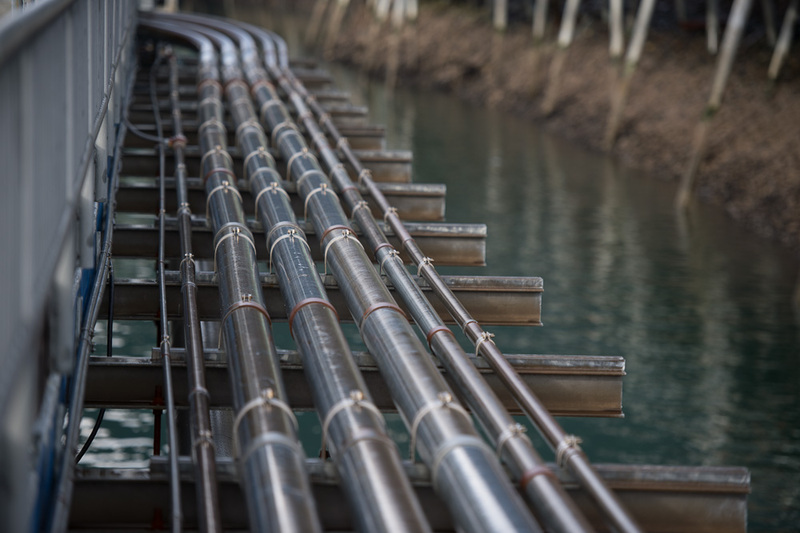 2013 to 2016 HAI provided electrical construction observation services including construction administration and field inspections. 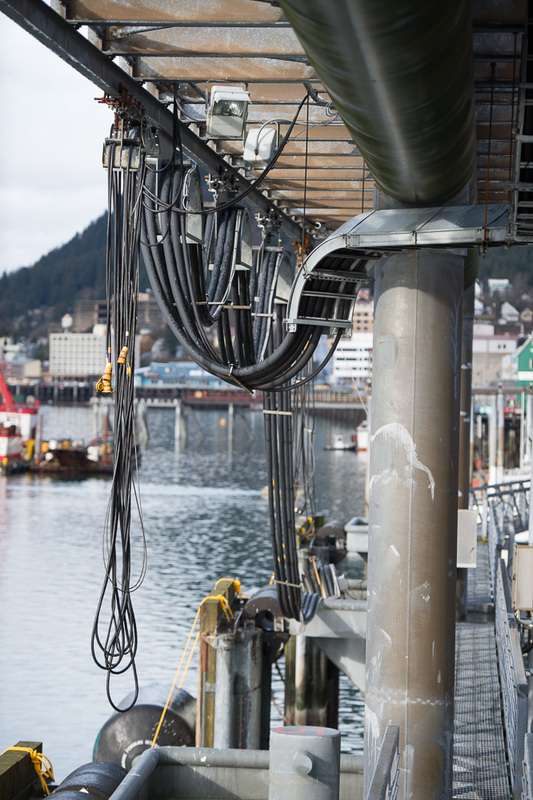 HAI had a great opportunity working with a great team of PND engineers and CBJ ports and Harbor. 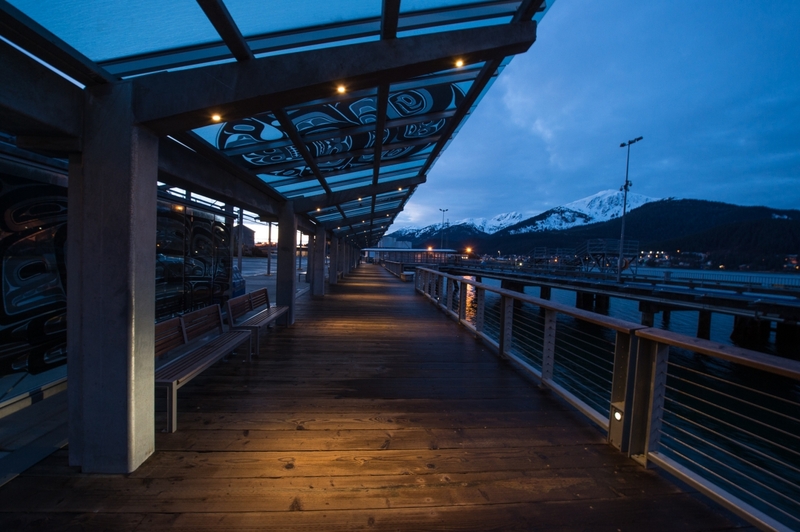 This project is a continuation of the Seawalk along the Juneau waterfront. 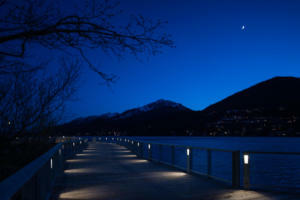 This phase of the project covers the lighting for Seawalk boardwalks and manmade island from Gold Creek to Bridge Park. 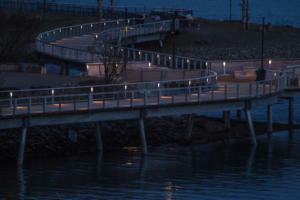 HAI provided a design for railing post mounted LED Step lighting and circuiting for Seawalk boardwalks and a top railing mounted linear LED lighting and circuiting on the island. 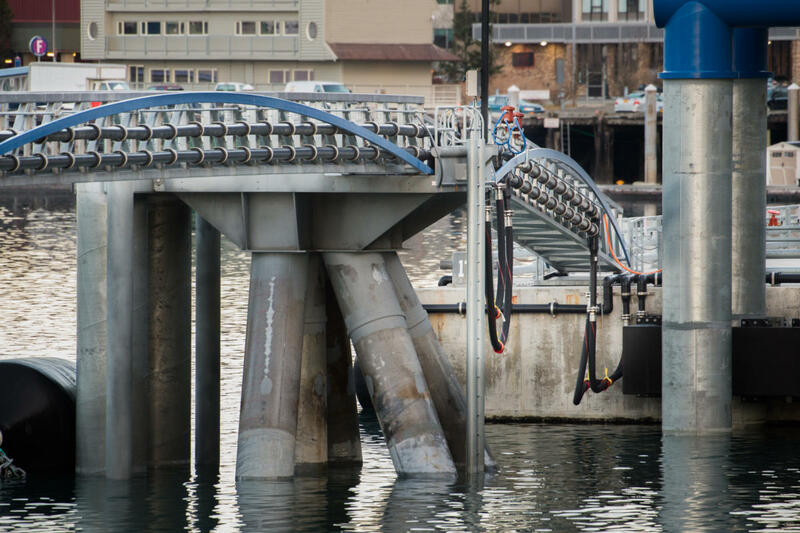 The controls and service for this phase are covered in the next phase Bridge Park. 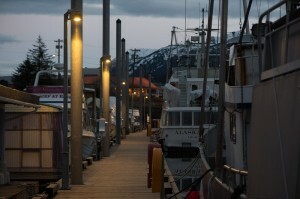 Banner poles without lighting were installed at the entrances on either end of boardwalk. 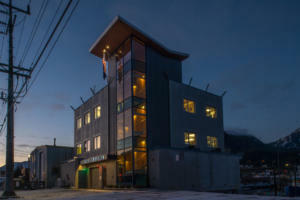 Unique and beautiful one and only distillery located heart of downtown Juneau, Haight & Associates felt honored to be part of an amazing design team and to work with remarkable owners. 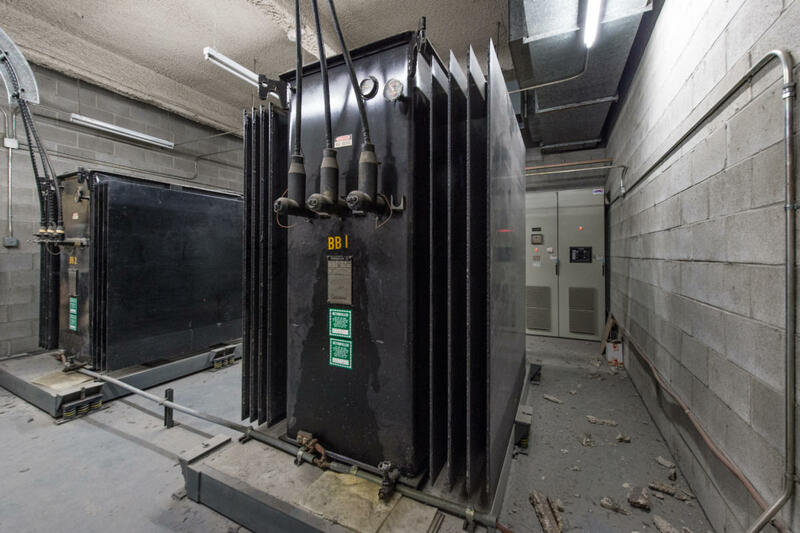 HAI provided professional drawings including power to all the equipment’s in the basement that plays a big part in the beautiful still. 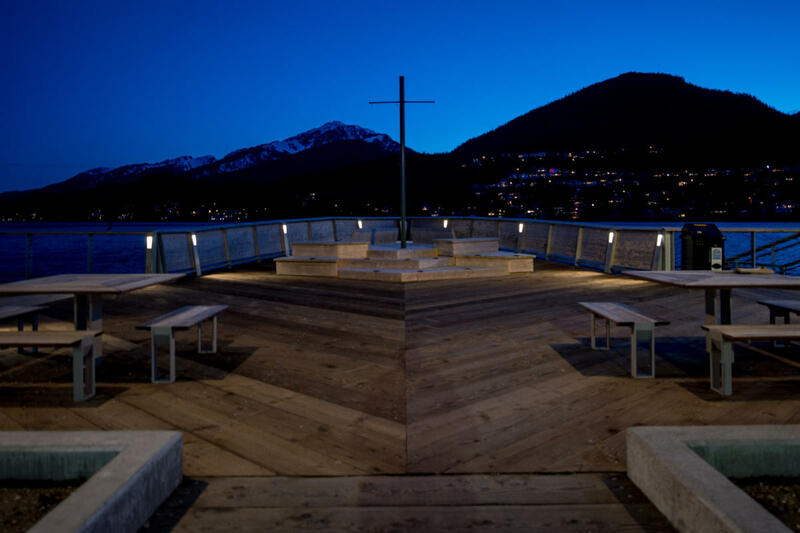 The new lighting for this space utilized all LED lamp source. Decorative track lighting was utilized as ambient light and highlighting for the space. This included both spot lighting to highlight bar counters and distillery equipment and decorative pendant s placed over tables. 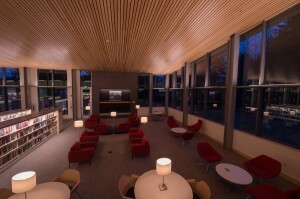 Floor mounted luminaires were placed in lounge seating area. 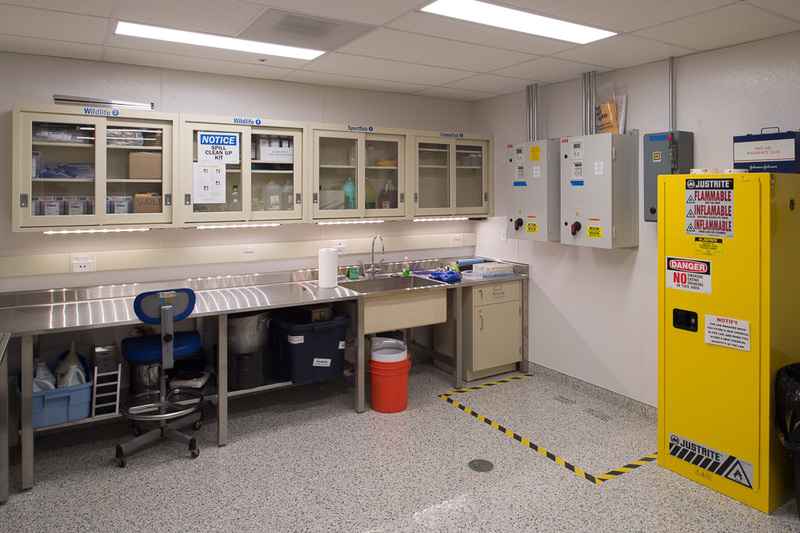 LED downlights and suspended and cabinet mounted linear LED luminaires were used in entries and blending room. 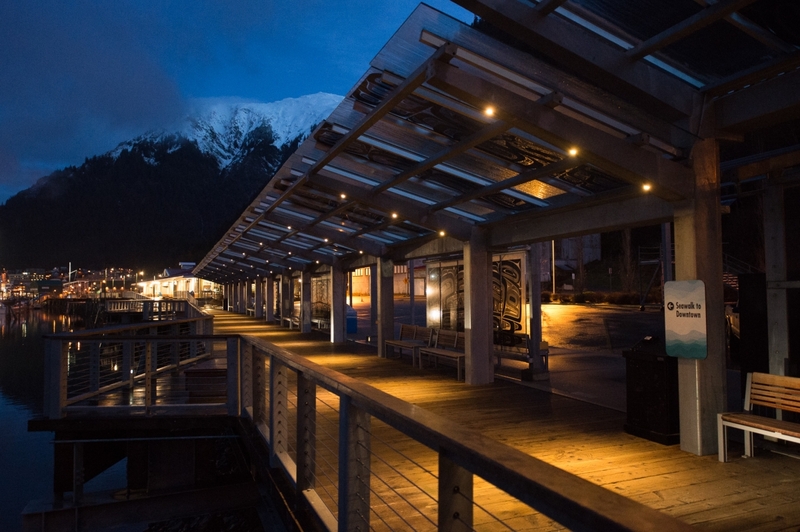 Ports and Harbor hired Haight & Associates to provide professional electrical engineering services for lighting of the Aquileans installed on the downtown Juneau Cruise Ship Dock. 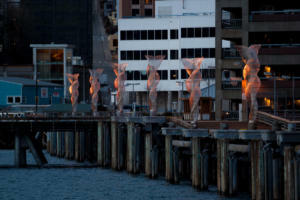 Project designed for ten sculptures with four lights per sculpture. HAI reviewed existing electrical conditions of the project area, designed power to four luminaires at each Aquileans, provided specifications. 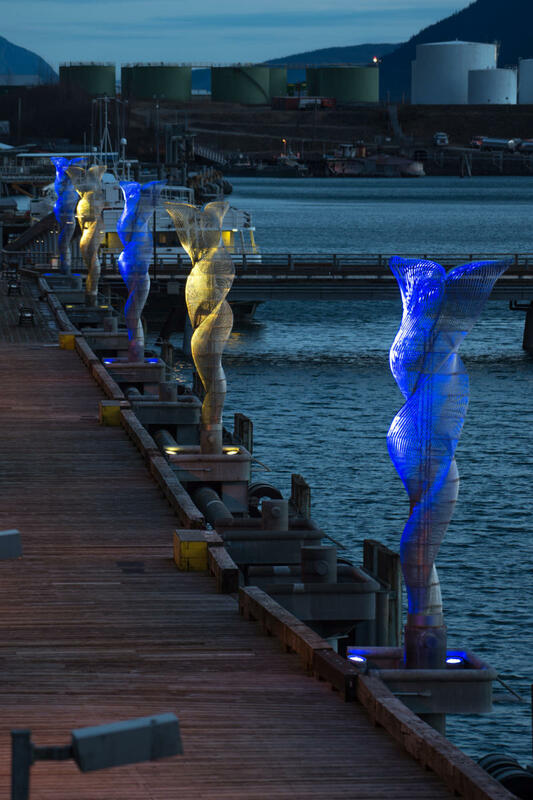 During install HAI worked closely with electrical contractor, Artist and the owner closely to bring the dream that Ports and Harbor had to life. 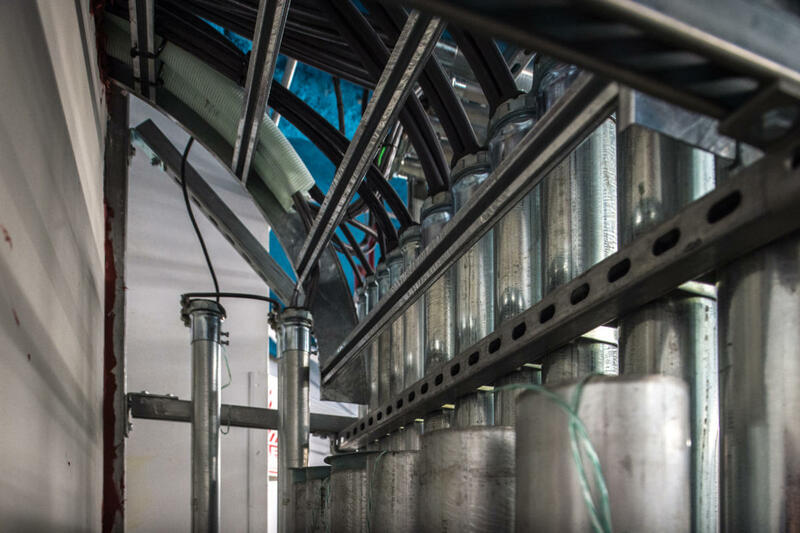 HAI completed the project with final inspection, end user training and user guide manual for daily use of the Owner. 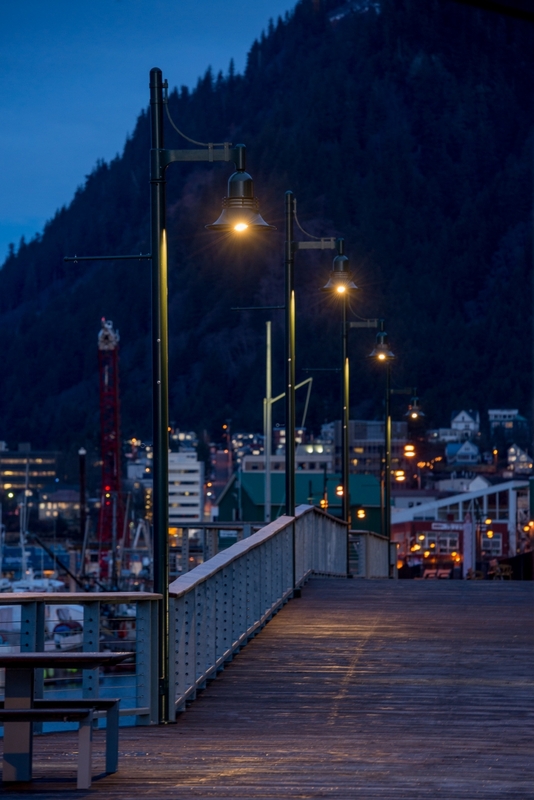 HAI was honored to be a part of this team, bringing lights to downtown Juneau and had the pleasure of creating beautiful lighting shows for the Juneau community. 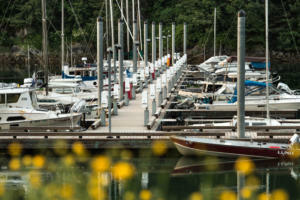 The need for additional parking and new launch ramps for Statter Harbor has been long awaited. For this project Haight & Associates was asked to design power and lighting for new launch ramp and parking area that would have minimal impact on the neighboring properties. 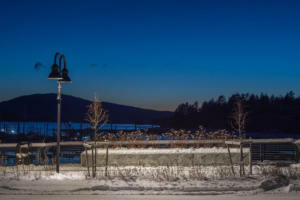 During the design phase, a 3D rendering was done for the parking area lighting. This was to show neighboring property owners that the lighting was low level and would have minimal light trespass on their properties. 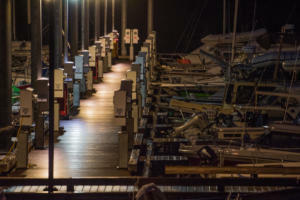 Provided were pole mounted area lights that covered the main parking area and pole mounted area lights to illuminate a walkway along the waters edge. 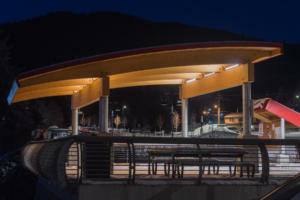 Lighting and power were also provided for a shelter overlooking the launch ramps. With the construction of the new student residence at UAS, Haight & Associates designed intricate schematics to include Power Systems, Lighting Systems, Network/Communications, Television, Fire Detection/Alarms, Access Control and Security. 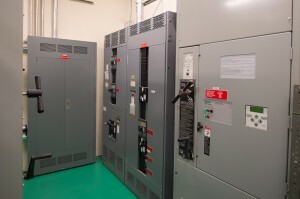 Power Systems included Utility Service, distribution and branch circuit systems, devices and equipment. 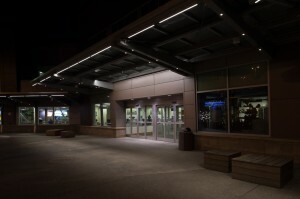 Lighting Systems included exterior and interior systems. 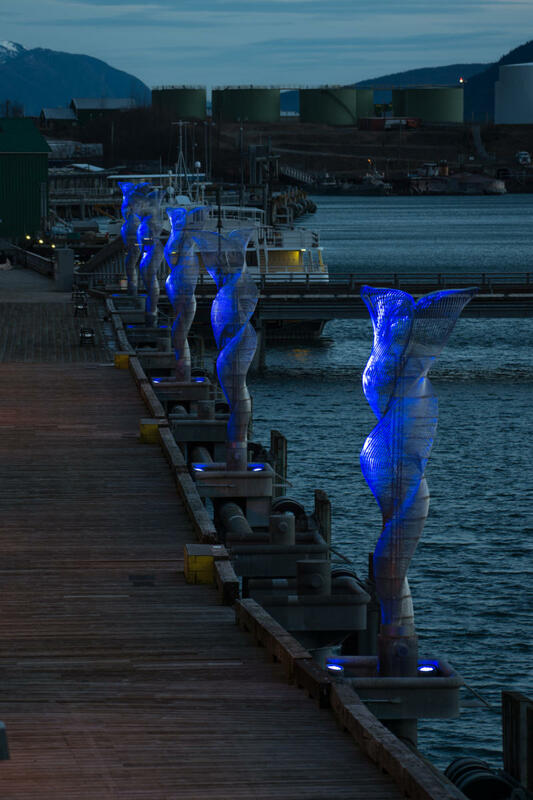 The exterior is supported with emergency power packs to maintain illumination for a minimum of 90 minutes in the event of a power outage. 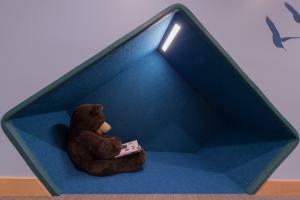 The interior was designed with surface mounted and recessed lighting fixtures with LED lighting. 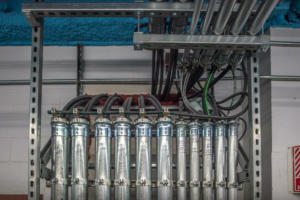 As this is a LEEDs project, low maintenance LED light engines are utilized for all luminaries in this facility. 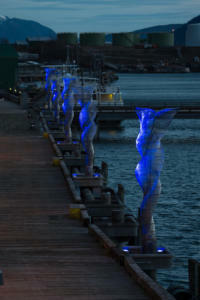 A 3500 degree K luminance is prominent throughout. 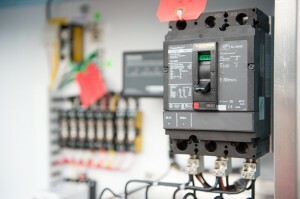 Low voltage controls are used with scheduling and occupancy control to limit use during inactive hours. Network/Communications for the new residence all was integrated with the campus network system using fiber-optic cable. The infrastructure incorporated runways in the electrical room and two terminal stations were installed. 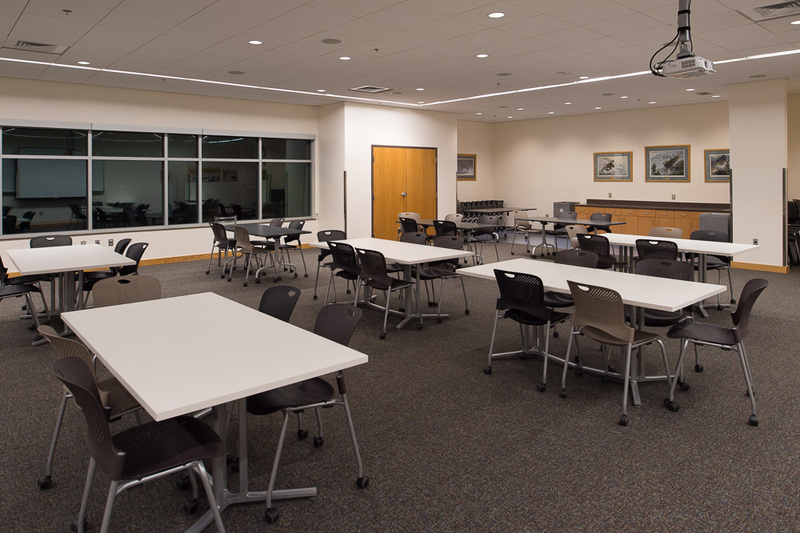 Additional network terminals are located in the study, lounge and seminar room to best accommodate the students/professors and guests. 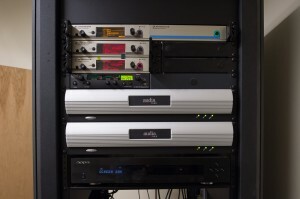 Television service and distribution is routed from the nearest utility source. It is amplified as required for the number of connection points within the building. Each dormitory room is provided with a terminal. Implementation of an automatic fire detection and alarm system is addressable with initiation and notification devised provided in compliance with the codes. 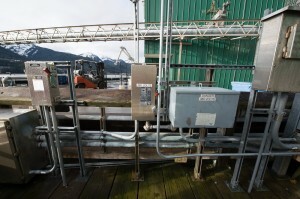 It also incorporates features for the elevator and sprinkler systems. 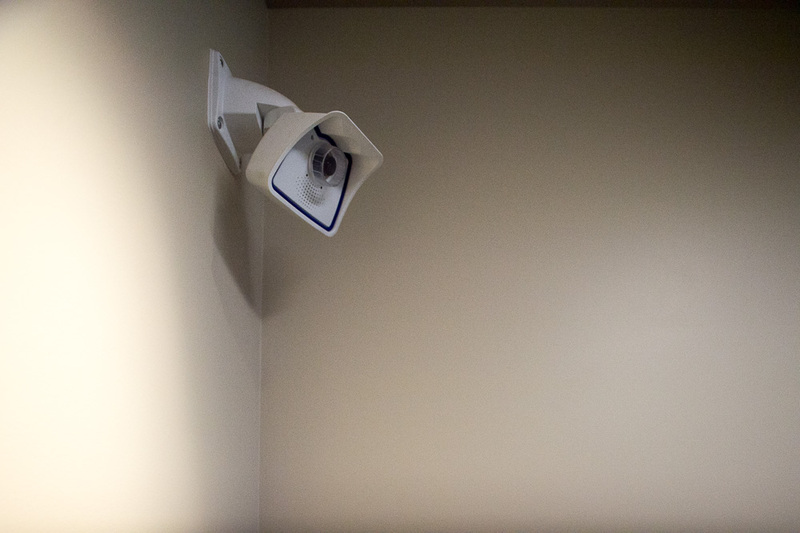 Access control and security included surveillance cameras, sensors indicating door open conditions and alarms. 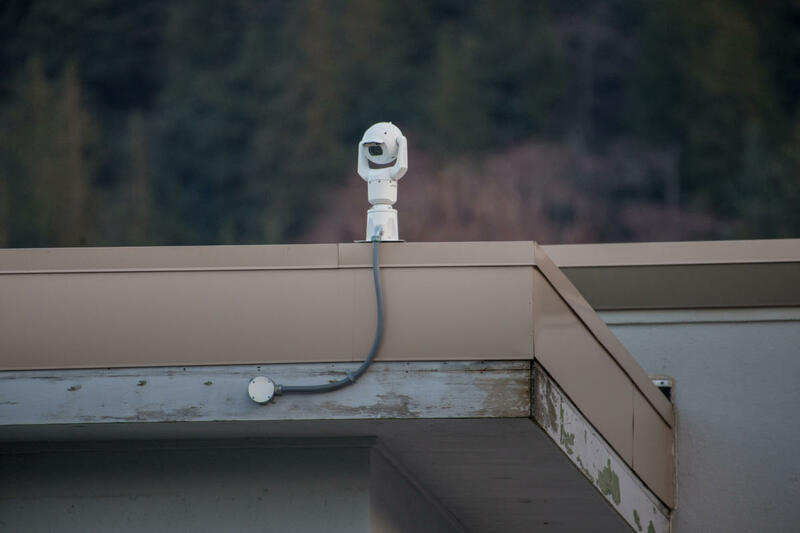 The cameras are programmed to allow image collection and video streaming when motion is sensed at certain locations. 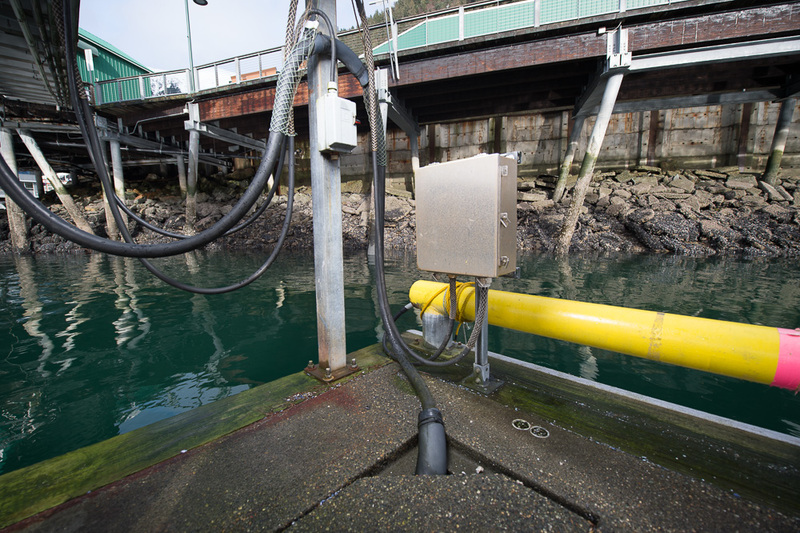 The system allows for storage allowing historic review as needed from monitoring systems. 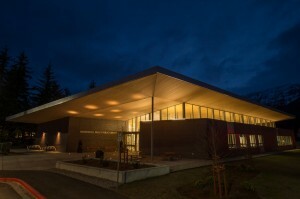 Mendenhall library was completed in 2015. 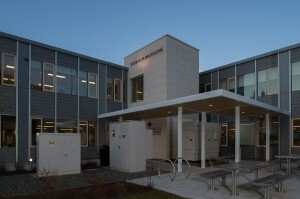 With the construction of the new library, Haight & Associates designed power systems, lighting systems, network & communication and access control. 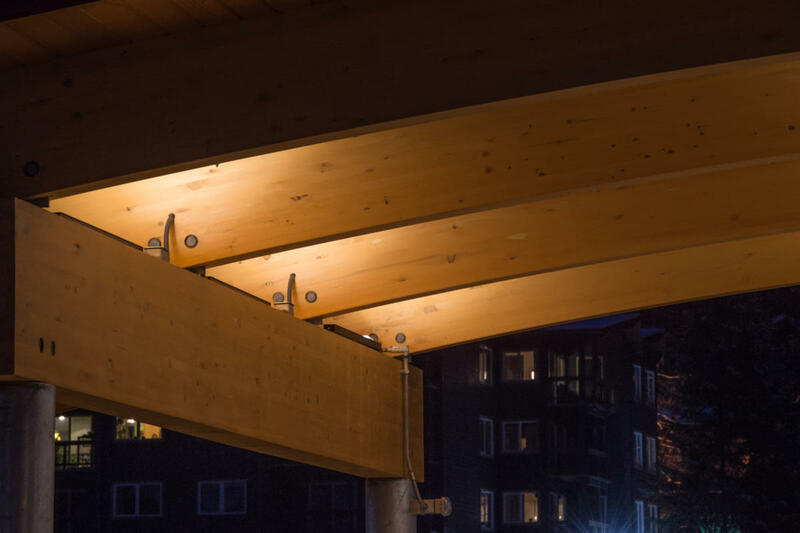 This facility is characterized by a roof that “floats” on columns above windows that surround the perimeter. 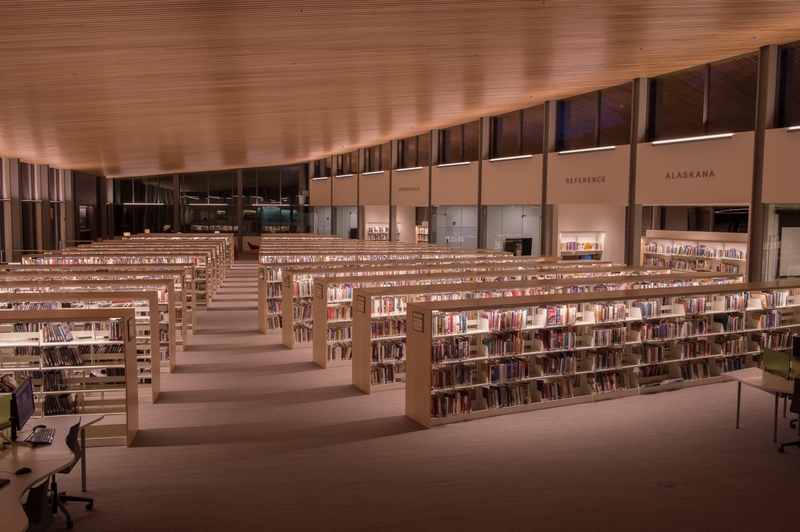 The lighting objective was to illuminate the spaces open to the upper ceiling utilizing indirect, reflective light and furniture mounted luminaires. No luminaires are mounted in or on the upper ceiling. All of the lighting for this library utilizes luminaires with LED light engines. The light is produced with a 3500 degree K color and is controlled with a low voltage system using manually selected preset scenarios and dimming of luminaires in specific areas. 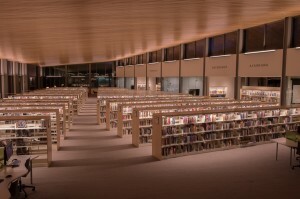 The roof of library extends well beyond the perimeter of the exterior walls allowing some of the interior light that is directed at the ceiling to also illuminate the eve. This is a LEED project so the light is limited to illuminate no further than the eve. 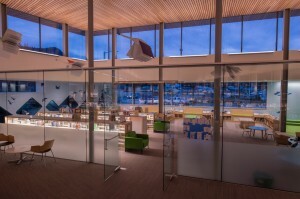 The primary area of the library is illuminated with linear luminaires mounted to the window structures. 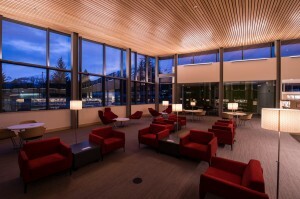 These luminaires are directed to illuminate the ceiling, thus reflecting to the floor towards the center of the space. 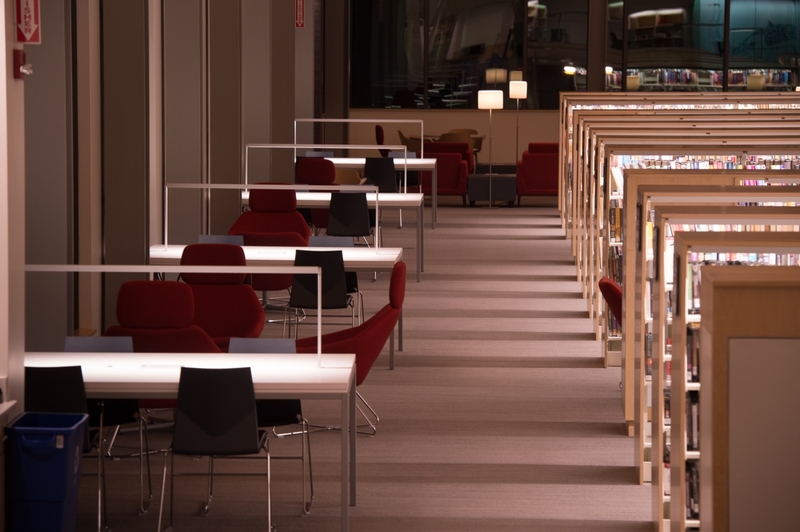 The stacks incorporate linear fixtures mounted at the top and directing light to the floor. 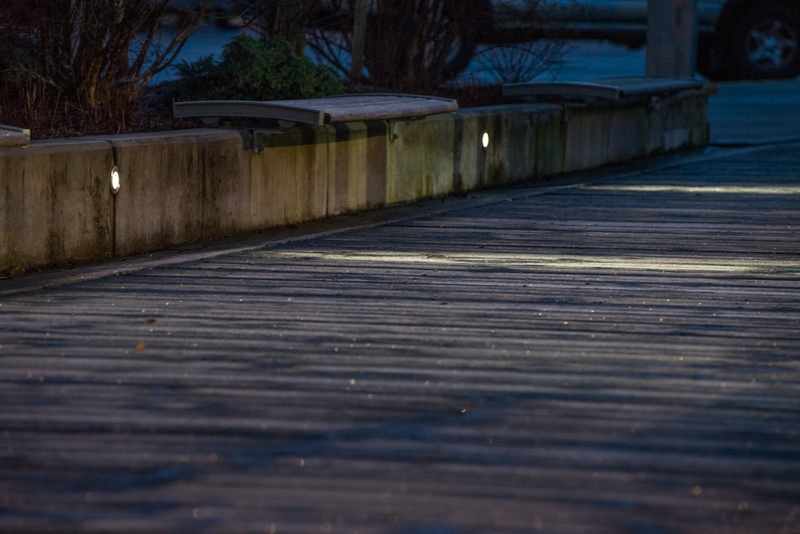 These luminaires include emergency battery packs to facilitate egress lighting. Light bars mounted above the study surfaces which provide task illumination. 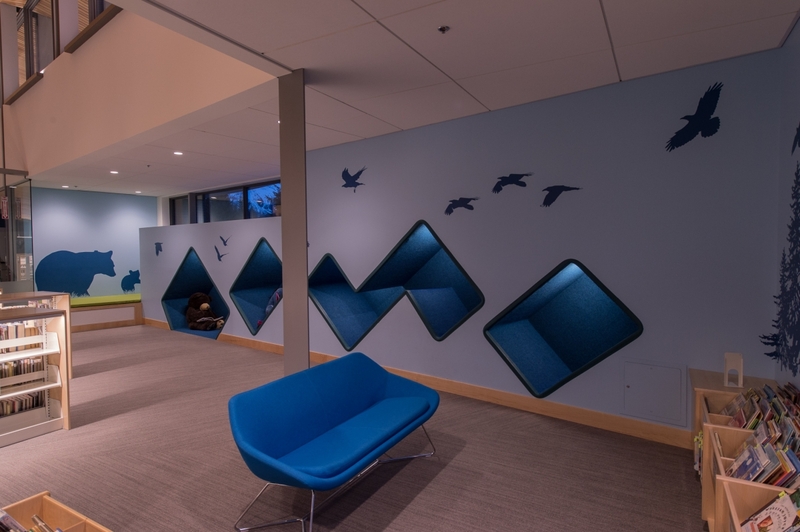 The children’s library features diagonal cubes built into the wall. The interior of these cubes include recessed linear fixtures providing illumination for bear and Eeyore, as well as the children visiting the library. 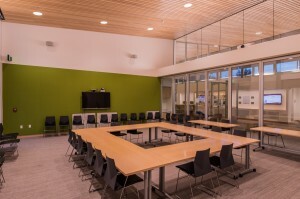 The meeting rooms have ceilings constructed below the upper roof. 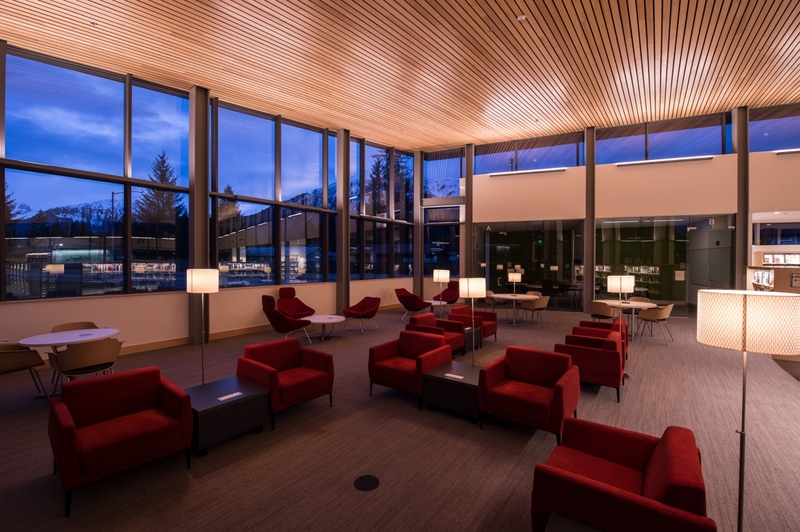 Luminaires are mounted above the soffits, wall, and ceiling providing indirect and direct illumination of the space. This provides uniform illumination of the entire volume. 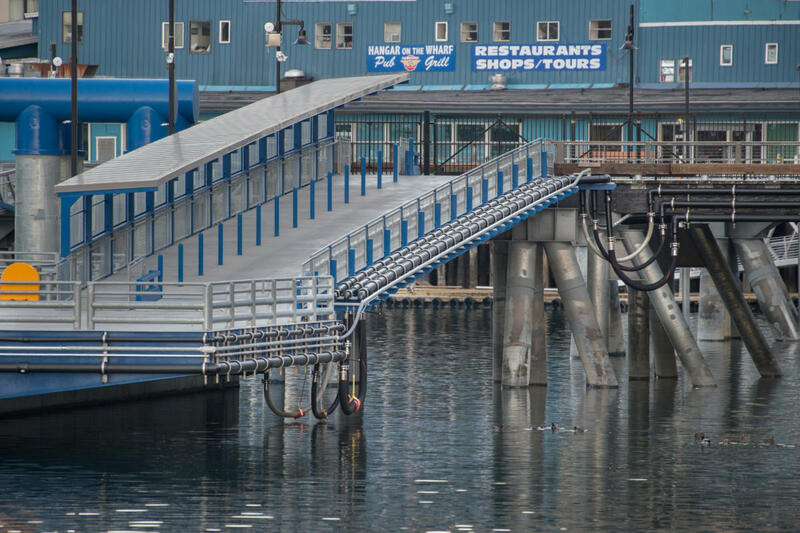 In 2015, we began and completed a project to construct a new seawalk from one of the cruise ship docks toward the town center. 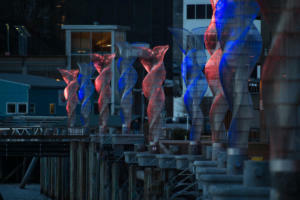 It includes several features that incorporate different lighting characteristics. 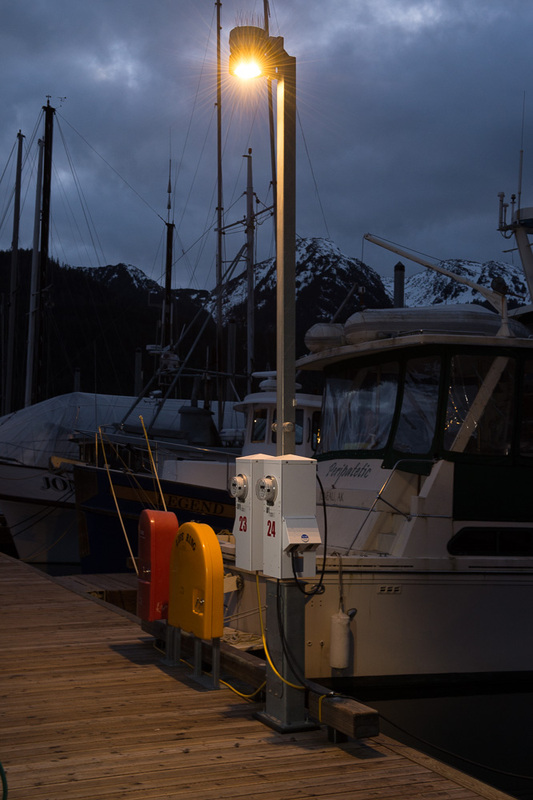 All of the luminaires utilize LED light engines with 3500 and 4000 degree K luminance. The seawalk originates at the cruise ship dock, passing beneath a translucent canopy. 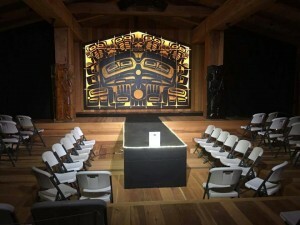 Native totemic art is included with some of the canopy panels. 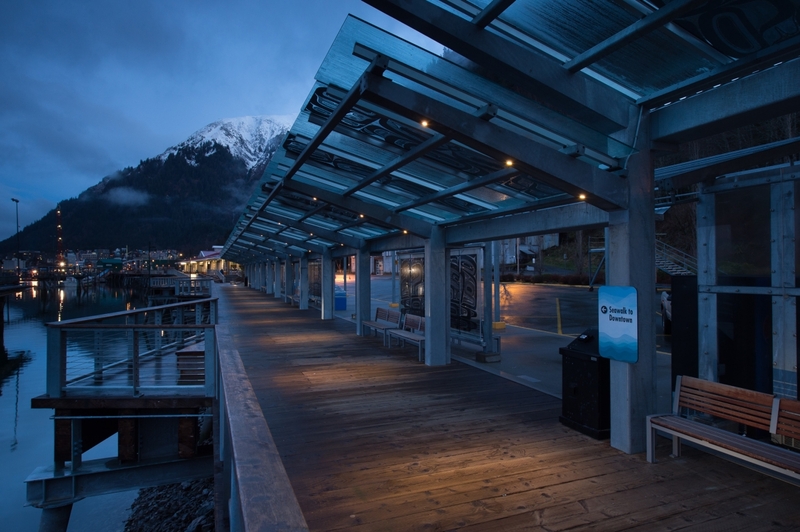 This area is illuminated with small marker lights with narrow beams mounted into the canopy support structure. 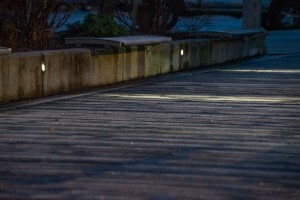 These provide lines of light across the walkway. The objective in this area is to direct the light downward in a relatively tight pattern. This allows the canopy panels with totemic art to silhouette against the evening sky without distractive artificial light. 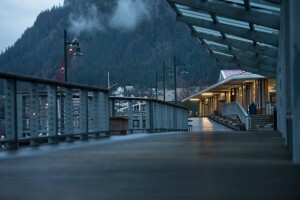 A section of the seawalk between the covered portion and a gift shop is featured with garden planters and sitting benches. 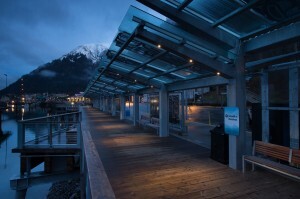 This is a wide area in the seawalk with small spurs leading landward to a bus parking area. 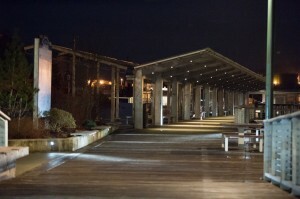 Marker lights are encased into the concrete walls surrounding the planters and supporting the benches. 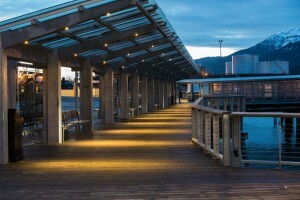 This project lights the walkways in this area. 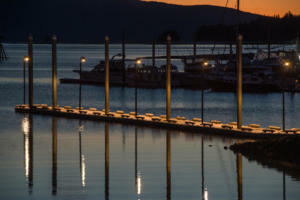 Three of the photos show straight round poles supporting decorative, period style luminaires. 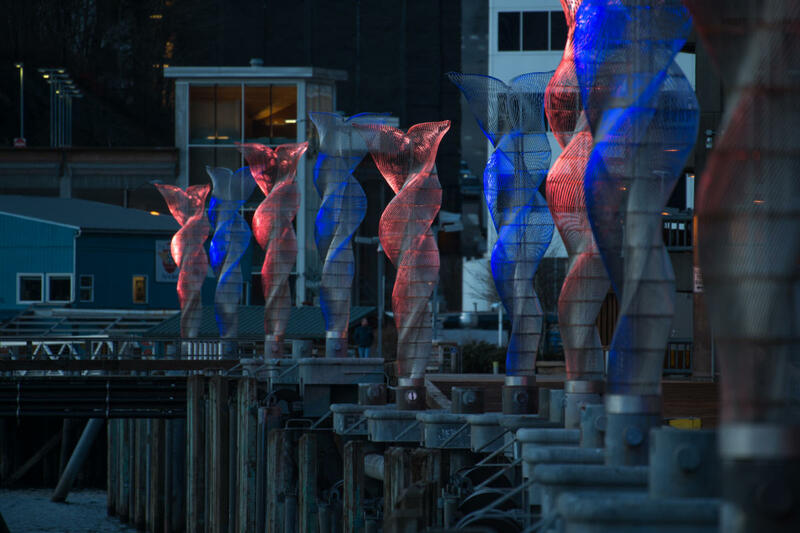 These are located on the water side of the walkway, illuminating the pathway from the canopy to the far end of the project. 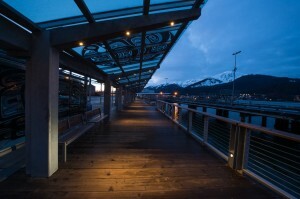 These luminaires are a cutoff type projecting most of their light directly to the walkway deck. The intent is to facilitate viewing from the seawalk out over the waterfront without objectionable artificial light. 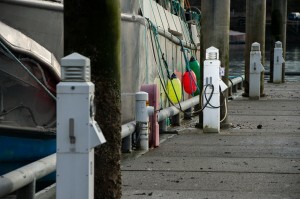 The poles include brackets for supporting decorative flags in the summer. Replaced the power distribution system in the East Wing. Integrated existing components not deleted. 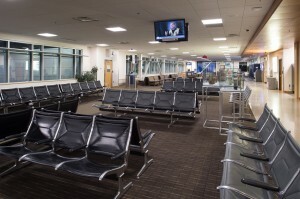 New circuiting and devices in the addition and renovated part of the terminal. New lighting and lighting controls in the addition and renovated part of the terminal. Relocate some lighting in the Alaska Airlines first floor offices, the TSA baggage screening area, and Departure Lounge. 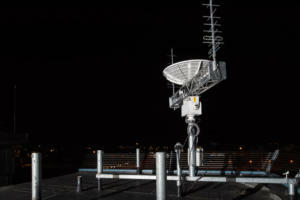 New Network & Communications system for the addition and renovated area. 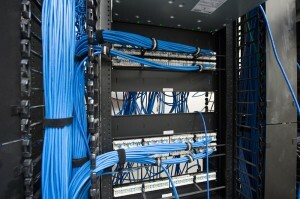 Includes cable trays and new cabling. New Fire Alarm system. 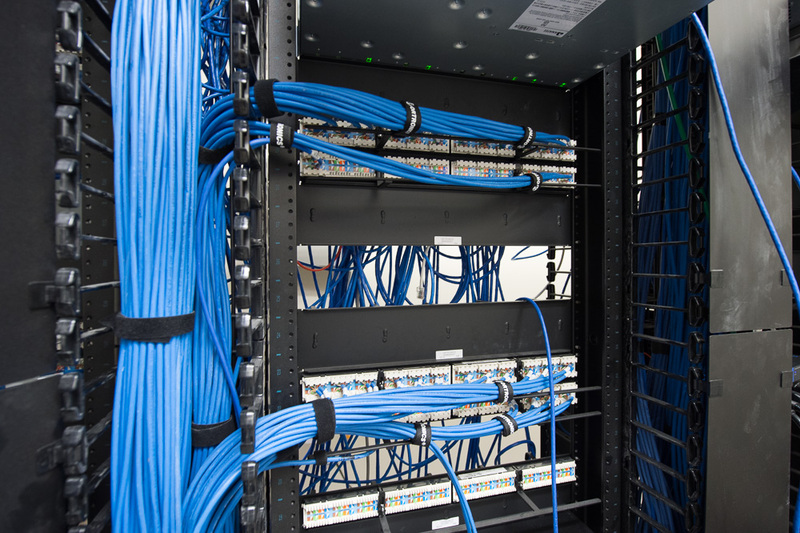 Requires integration of zones and devices outside the project area. 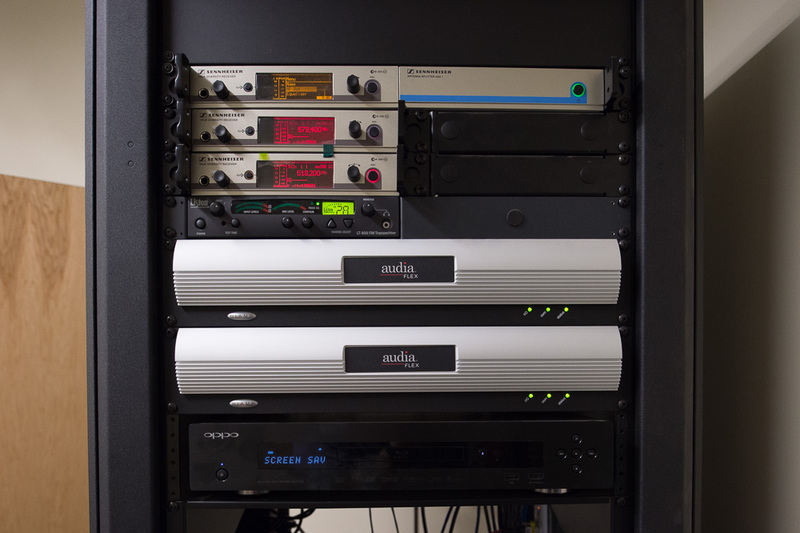 Public Address System for the addition and renovated area. 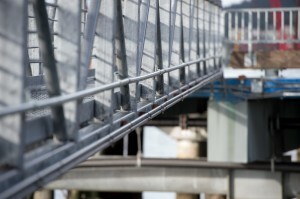 Requires integration of the circuits, equipment, and devices outside the project area. Door and Access Controls in the addition and renovated area. Required installation of raceways to allow equipment and system by others. 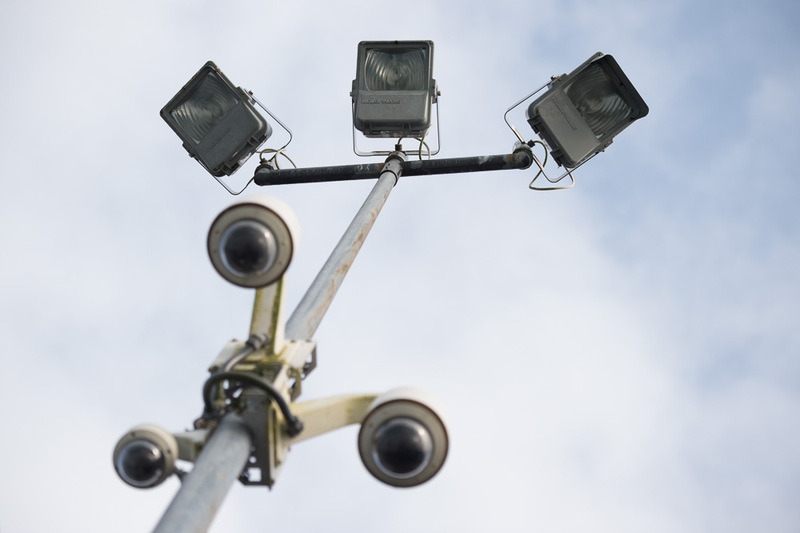 Surveillance cameras: in the addition and renovated area: Required installation of raceways to allow equipment and system by others. New lighting for the restaurant deck. 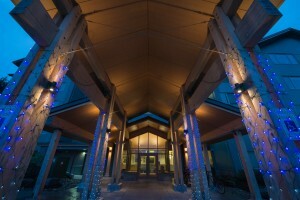 New lighting for the entrance – in the soffit and perhaps in the walls. New PA speakers on the restaurant deck and in the entrance soffit. New cameras in the entrance soffit. 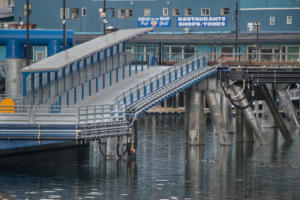 New maintenance receptacles at the main entrance and on the restaurant deck. 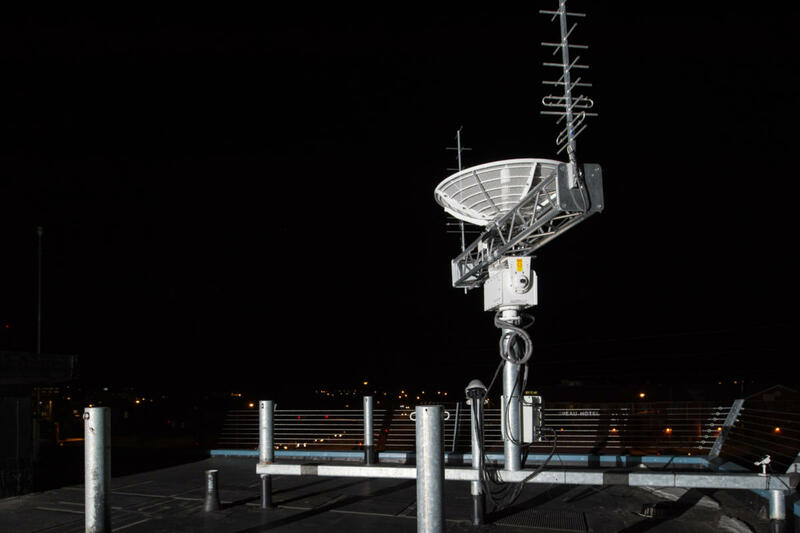 The ALRCS is a state-of-the-art Airfield Lighting Remote Control System, microprocessor based and software-controlled, able to operate as a stand-alone system and to be expandable to be connected as a subsystem to an Integrated Workstation. 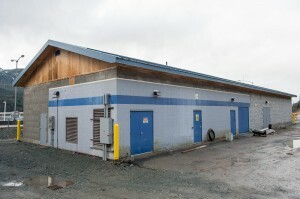 Department of Fish & Game Building on Douglas Island is a two-story steel-framed structure with basement boiler room constructed in early 1960’s. Haight & Associates, Inc. was subcontracted by Northwind Architects for new branch circuitry, Lighting controls, Fire Alarm System, Access Control and network Data & Communication. 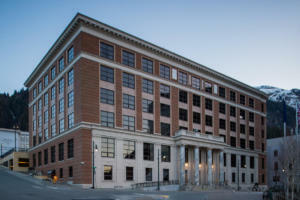 The Douglas Island Building major renovation work scope included Condition Assessment, Surveys, Design, Construction, Inspection, Equipment, and system testing and operations, maintenance and construction management. 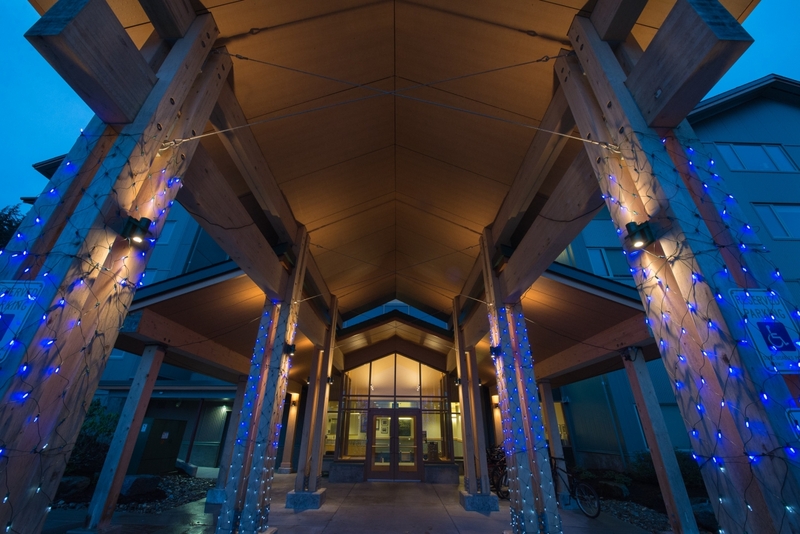 All of the lighting for the Department of Fish & Game building utilizes luminaries with LED light engines. The light is produced with a 3500 degree K color and is controlled with a low voltage system using manually selected preset scenarios and dimming of luminaries in specific areas. 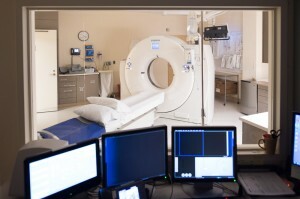 The first phase consisted of renovation of the existing file room for a smaller back-up CT scan. Work included removal of existing high-density compact mobile file storage system; selective demolition; installation of lead-lined walls, doors, and lead glass relites; new control and equipment rooms; new casework; new finishes as required; new electrical power and lighting, new medical gasses, new communications & data, cable TV, Nurse Call, Fire Alarm and Security Cameras. The second phase consists of removing the existing Philips CT scan and related equipment and installation of new Siemens CT scan and related equipment. 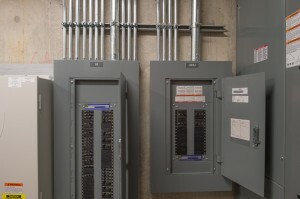 Power Distribution: The existing branch panels, A and B, will be removed and disconnected from the distribution panel in the main electrical room. 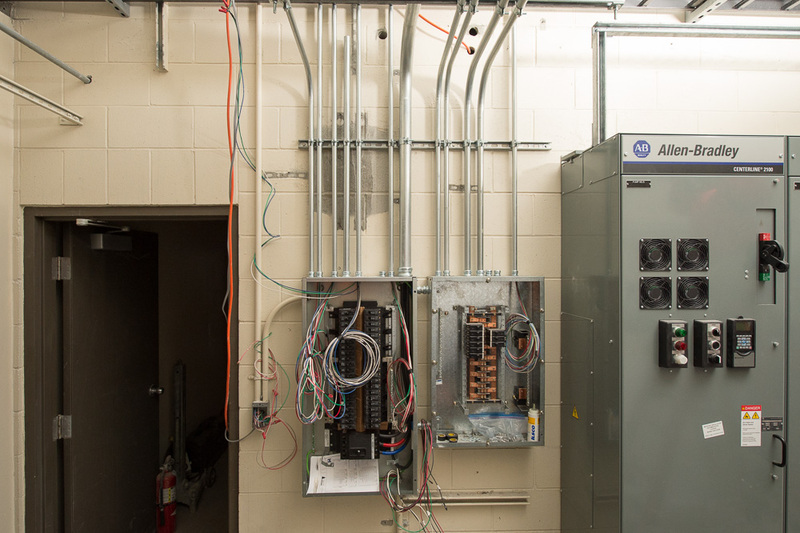 New branch circuits will be routed from panels installed in the third floor electrical room. These panels have circuit space designated for the renovation of this wing. Patient Rooms: Headwall and receptacle features will be similar to those installed in the rooms along the south and north corridors. Additional receptacles may be installed in the area normally occupied by guests for laptop computers. Additional circuiting was installed in the rooms to facilitate additional equipment as required. This equipment is powered from the Critical Branch emergency source. Solarium: Receptacles installed around the room with approximately 10 foot spacing. 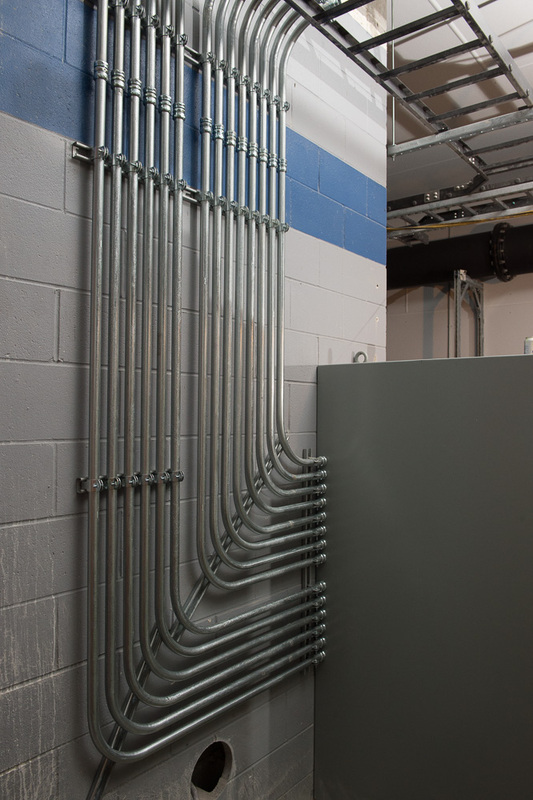 Additional receptacles will be installed for the TV and other desired equipment. 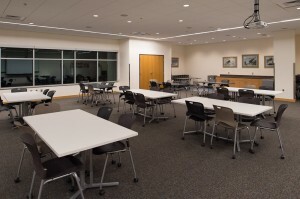 Conference Room: Receptacles installed around the room with 8 to 12 foot spacing. 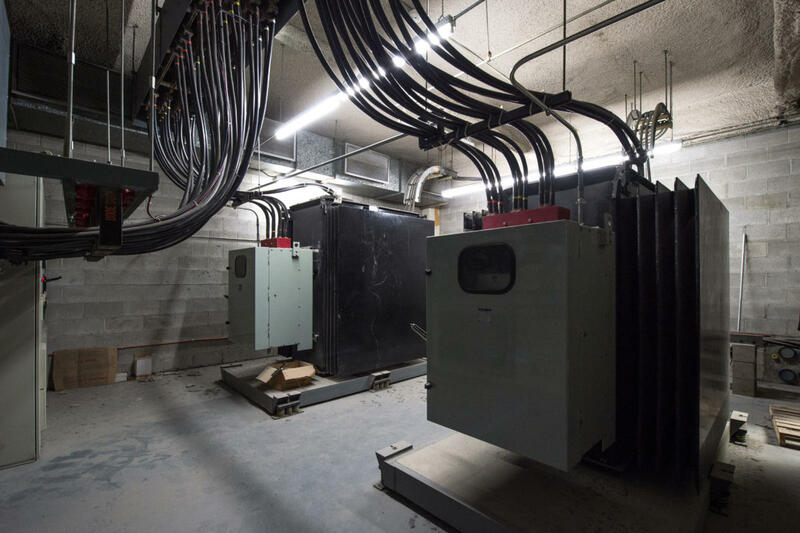 Additional receptacles will be installed for equipment, TV, and ceiling mounted projector, with a floor receptacle in the center of the room. 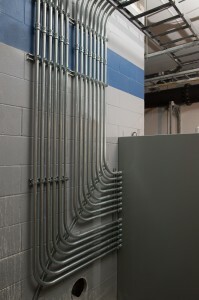 Offices: Double receptacles are located on each wall. 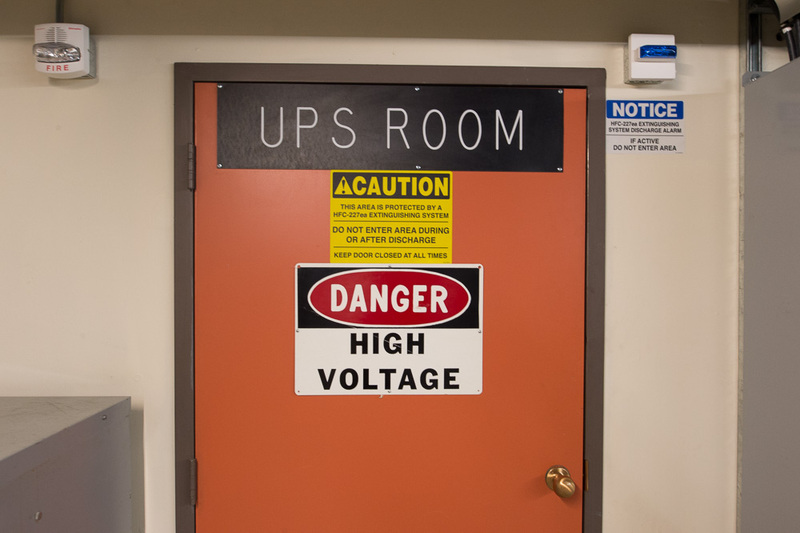 Storage: Receptacles are located on each wall in spaces most likely to be accessible. 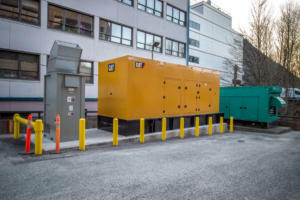 Providing emergency power (Equipment Branch) for the Omnicom equipment. Receptacles are located at approximately 40 foot spacing for cleaning. Additional receptacles are provided for the nutrition station and other desired equipment. 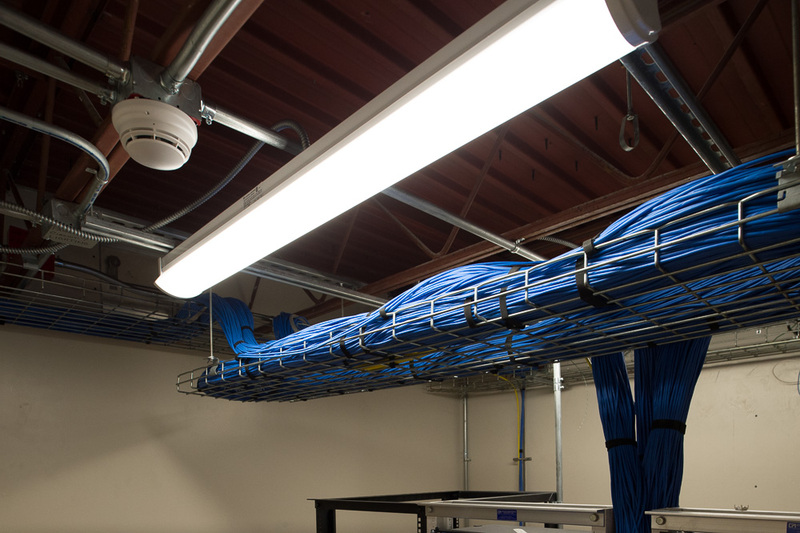 Receptacles are provided in the ceilings at strategic locations for wireless transceivers. These are at each end of the corridor. 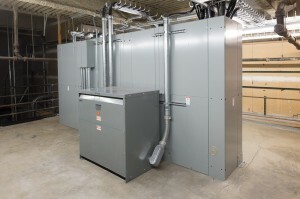 HVAC: Power for ventilation, air conditioning, and controls will be circuited from panels located in the Penthouse Z1. Control equipment is provided as needed. 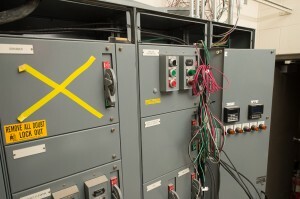 Emergency Power: Receptacles and equipment are connected to Critical Branch, Equipment Branch, and Life Safety Branch in a manner similar to that used for the previous Med Surg project. 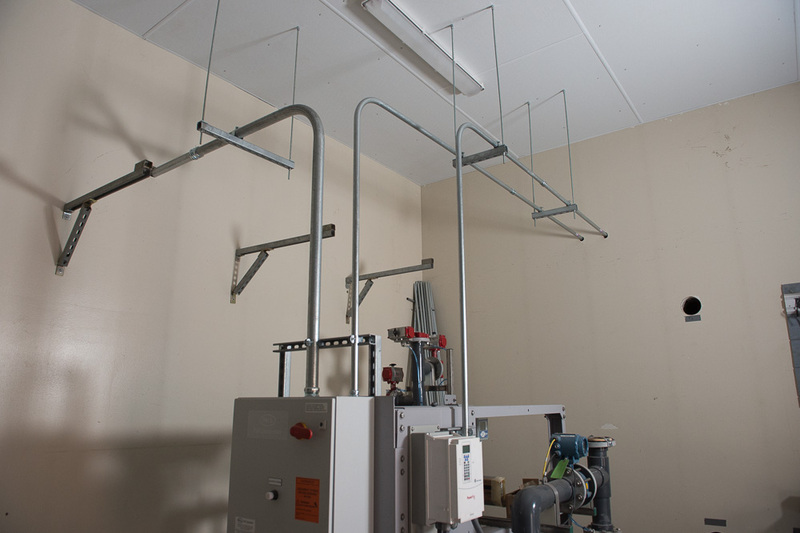 The installation in accordance to NFPA 99. Aurora Harbor is a marina used for rented docking and shore tie power by commercial boat owners. Phase I of the Aurora Harbor Rebuild project consisted of replacing the southern third of the marina. Haight & Associates designed shore tie power distribution, LED lighting, and water pedestal heat trace. 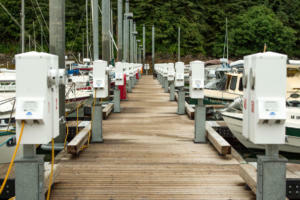 Shore tie power distribution provided separately metered power pedestals at all boat rentals spaces. 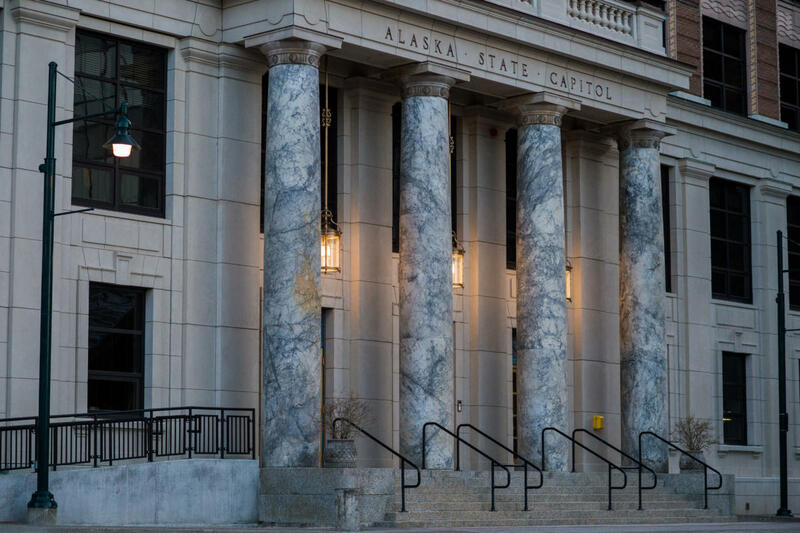 All power pedestals are powered from one of two separate power centers, which also provide branch circuits for LED lighting, heat trace, the sewer pump, and other associated electrical loads. 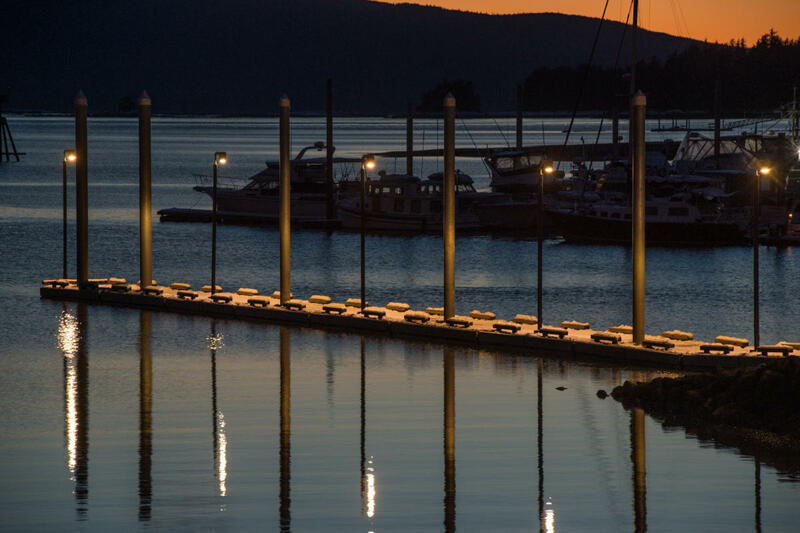 Robust LED luminaires were designed to emit precise lighting along the floats and gangways with minimal light pollution and glare. Photoelectric lighting controls secure power to the LED luminaires during daylight hours. 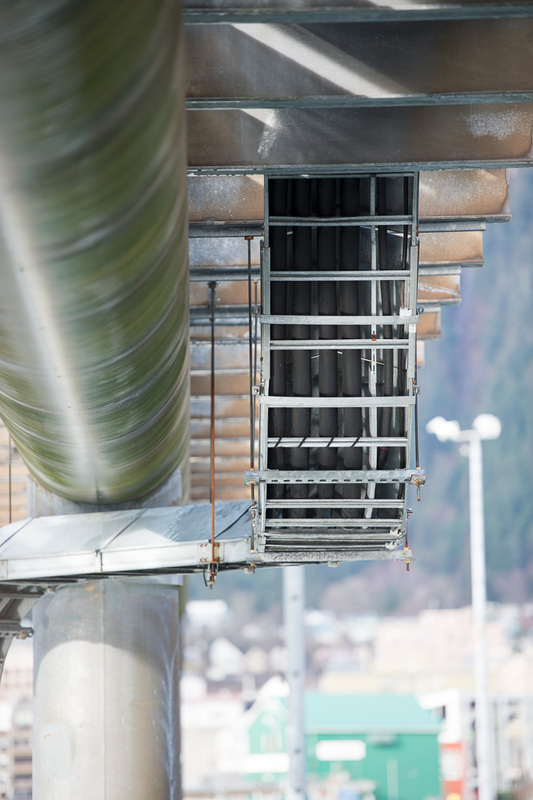 Heat trace was designed to prevent freezing at water pedestals and above ground water piping during cold weather. 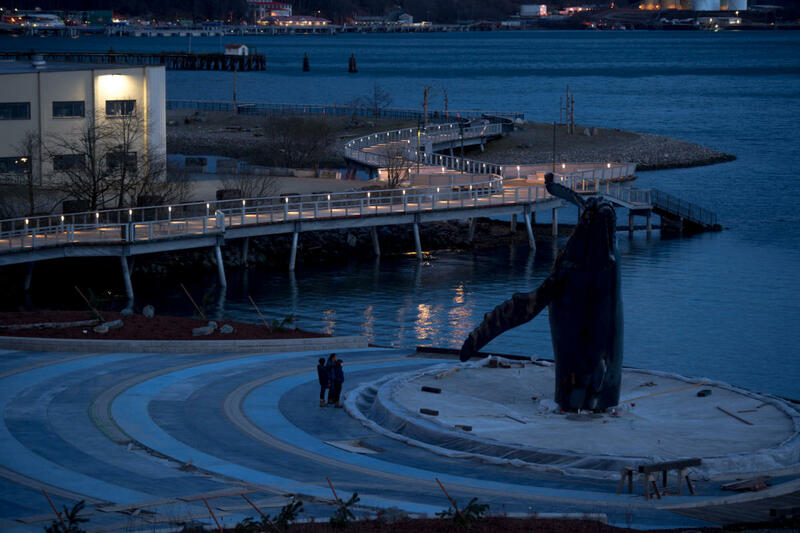 This provides fresh water throughout the renovated section of the harbor all year. 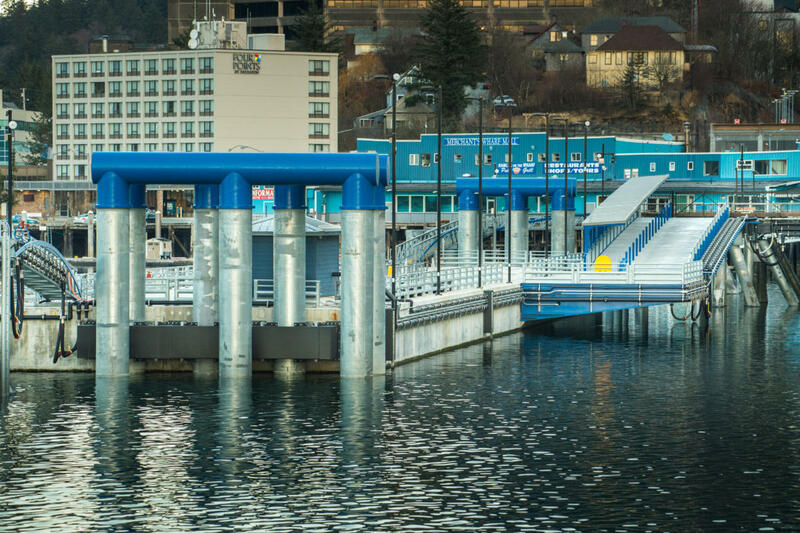 Haight and Associates completed the design of Aurora Harbor Phase I in March of 2014, and construction was completed in summer of 2015. 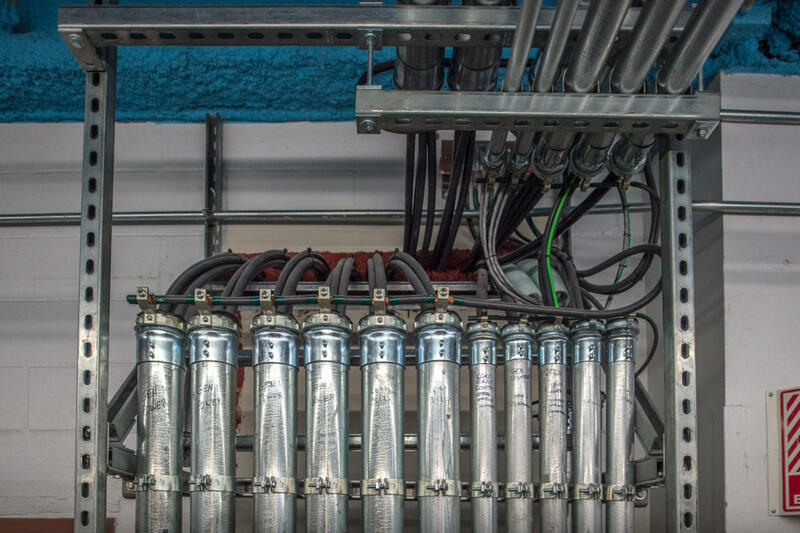 With the reconfiguration of the State UPS, we increased system reliability by eliminating single points of failure on the protected side of the system. We replaced a 300KVA UPS with a 450KVA UPS. 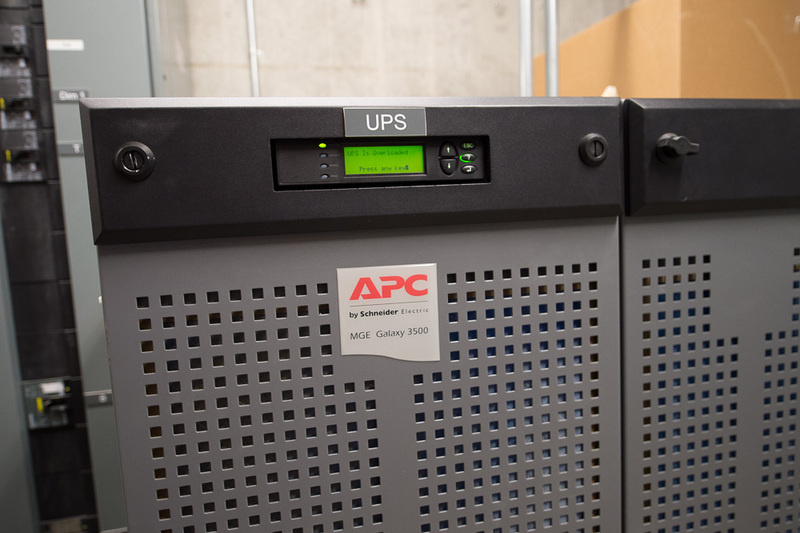 The system operates in a typical parallel configuration, and will allow the UPS’s to equally share the load. 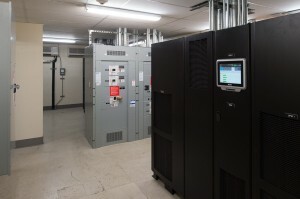 System controls were reconfigured to synchronize the UPS’s to one another and to the utility. If one of the UPS fails, it will remove itself from the bus-bar, if the second UPS fails, the static switch will pass the load to the utility. The Salmon Creek Filtration Plant provides filtered and treated water to the Salmon Creek reservoir. 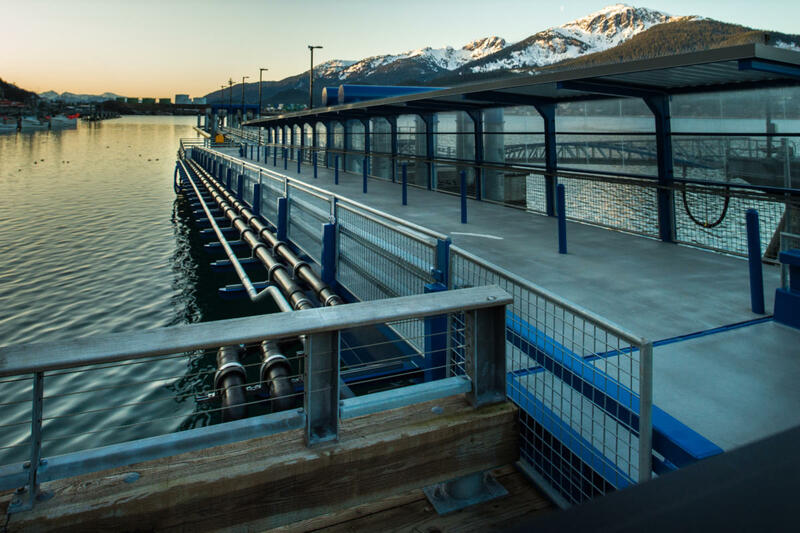 The new filtration plant was designed to filter, treat, and pump more water to the reservoir via a state of the art filtration system and new water pumps. 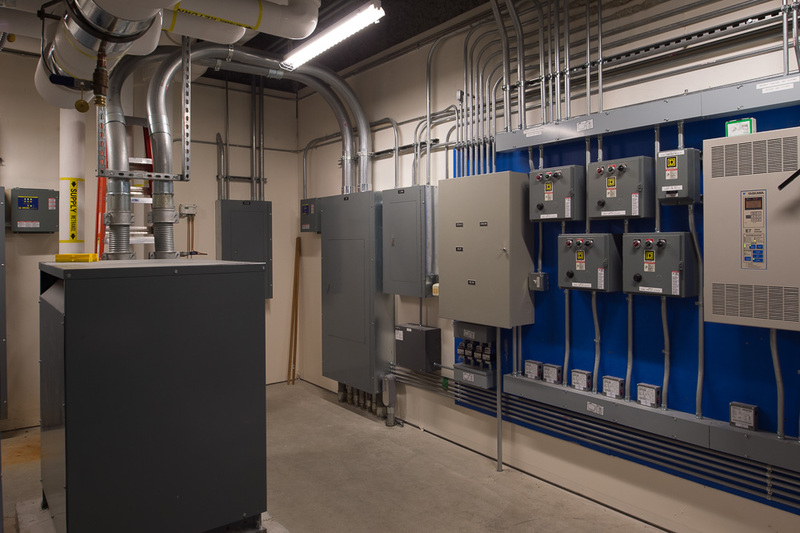 Haight & Associates designed the power distribution, pump controls, programmable logic controller (PLC) retrofitting, telecommunications, LED lighting, heating, ventilation, filter device communications, and emergency power. Haight and Associates completed the design for the project in June of 2015 and construction was completed in the spring of 2016. The power distribution consisted of a new power feeder to a new motor control center in the filtration plant and branch circuits to all new electrical loads. 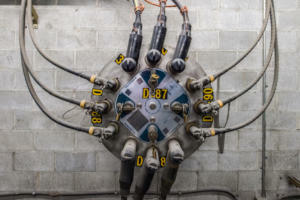 The electrical loads in the filtration plant were fed via cables from a fiberglass cable tray. 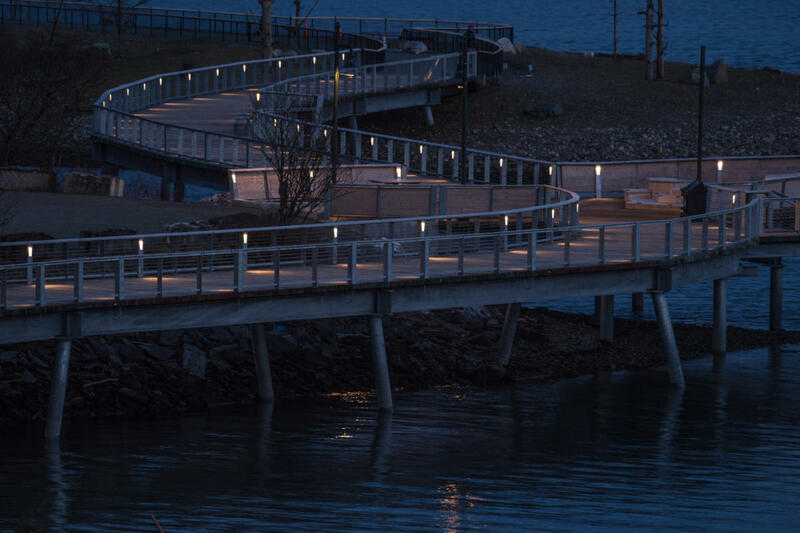 Industrial LED lighting was designed for the interior and exterior of the filtration plant. Photoelectric sensors control the exterior lighting, and manual switches control the interior lighting. Thermostat controlled heating and ventilation control the temperature inside the filtration building. 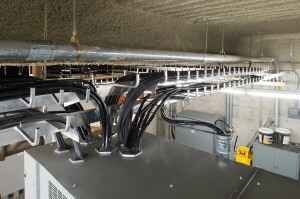 Electric unit heaters with fans and an intake fan with gravity vents keep the interior of the filtration plant at a suitable temperature while providing air exchange. 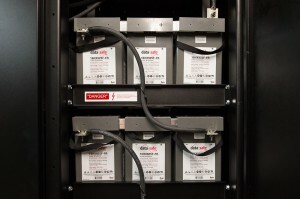 Emergency power is provided by a battery-equipped Uninterrupted Power Supply (UPS). The filtration building office computer, all PLCs, and a few miscellaneous devices are powered from the UPS. 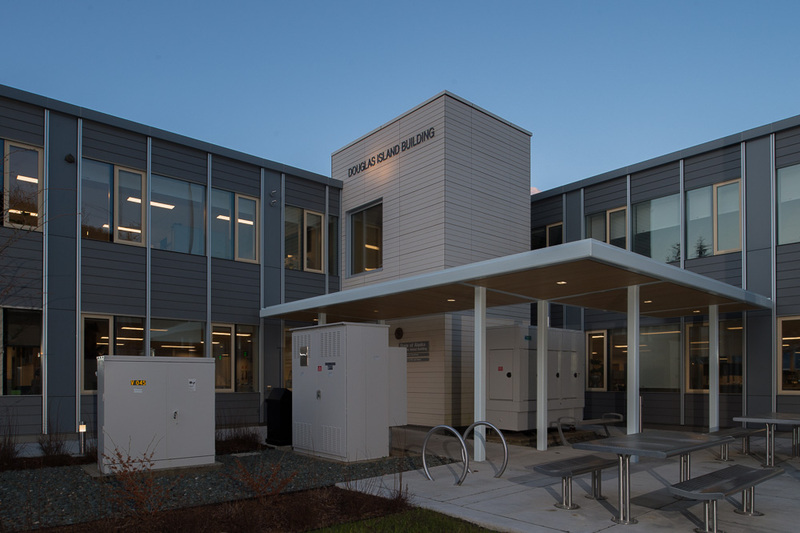 Haight & Associates designed the electrical systems for a new two story building that include a veterinary clinic on the first floor, an office and one bedroom apartment on the second floor. The lighting design, provided quality LED luminaires to produce both ambient and task lighting for the clinic and apartment. 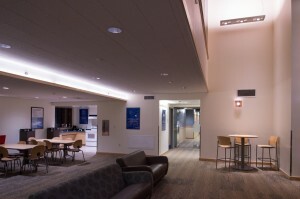 For ambient lighting in waiting, reception, hallways and apartment, low cost LED downlights were used. 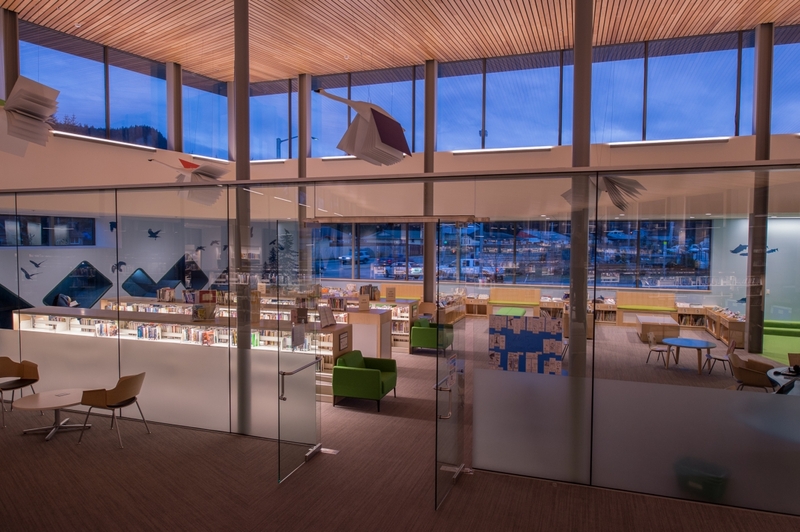 Either recessed or surface mounted Linear LED luminaires were use throughout the rest of the spaces. Emergency battery packs are integrated into some of the downlights and linear wraparound to provide a path of egress. 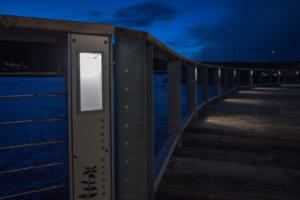 For the exterior of the building wall mounted LED sconces were placed above or beside each man door. To highlight the main entry a couple of decorative sconces were used. 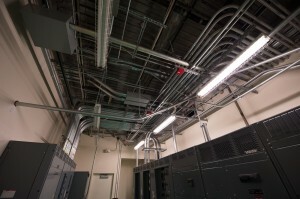 For lighting controls, occupancy sensors were provided in addition to single pole or three-way switches. Dimming controls were provided where requested. 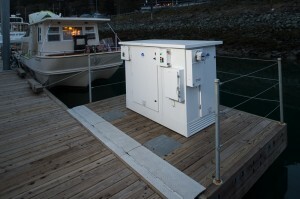 Power system included Utility servicers, distribution and branch circuit systems, devices and equipment. 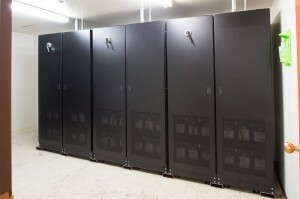 HAI has provided unique and easily accessible power system for Dr. Smith to use during surgeries creating a state-of-the-art Operation Theater Room. 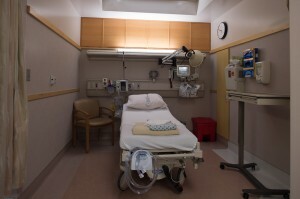 Surgery room was provided with power for light fixture that can be moved around in the room as needed for complete optimal and visual accuracy. 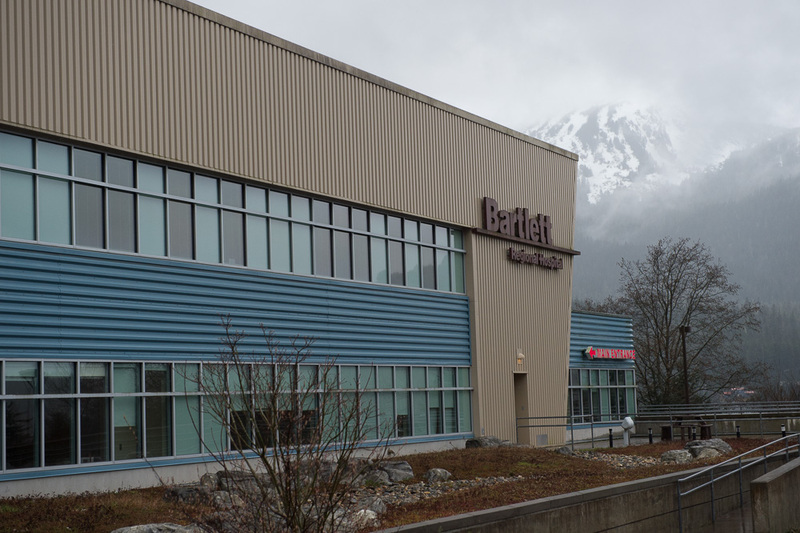 HAI had a great experience working with Tongass Veterinary staff and Miller Construction. 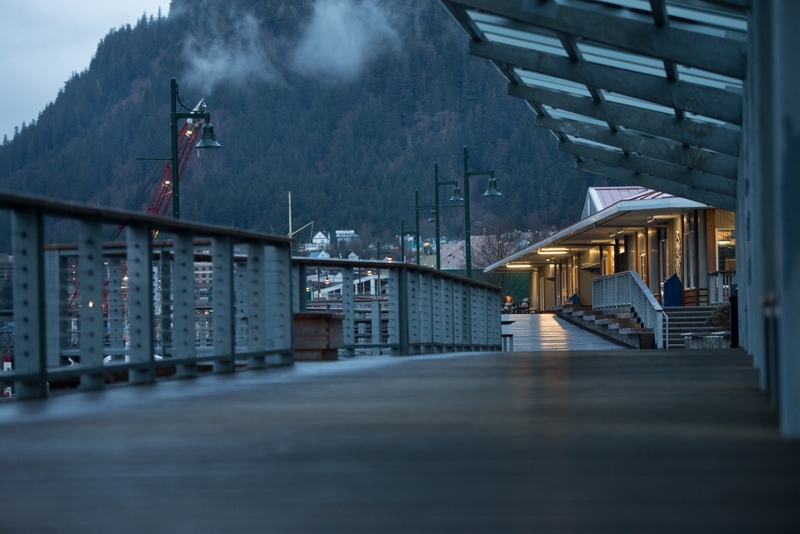 The need for low cost affordable housing in Juneau has been an issue for a long time. The increase in the homeless population has put a strain on the only homeless shelter in town. 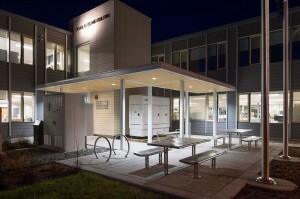 Haight & Associates joined a team to provide housing and care for the homeless. 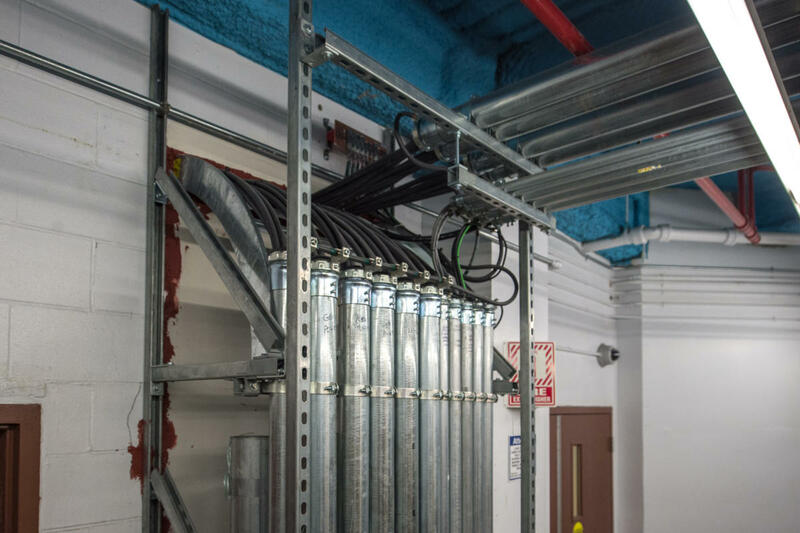 Haight & Associates designed power, lighting, television, data, an addressable fire alarm system, surveillance and secure access for this facility. Housing First has 32 single bed units, each with a full bathroom and a kitchen/dining area. Each unit contains low cost LED junction box mounted downlighting for ambient lighting in the living area, controlled with three-way wall switches. The bathroom has a linear wall mounted LED over the mirror and is controlled with an occupancy sensor. Power is also provided for kitchen appliances including a cooking range, a hood fan, and a refrigerator. 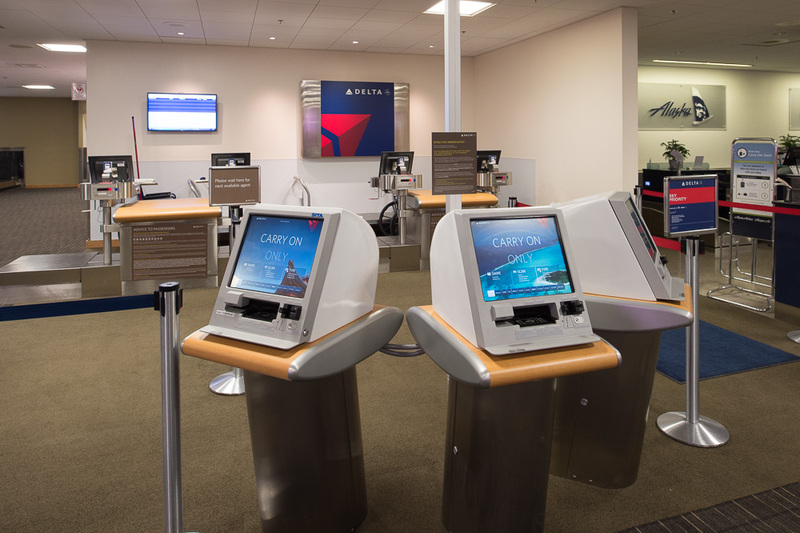 Each unit is also equipped with an intercom station and a talkback speaker, allowing for communication between each unit and the master intercom station at the front desk. 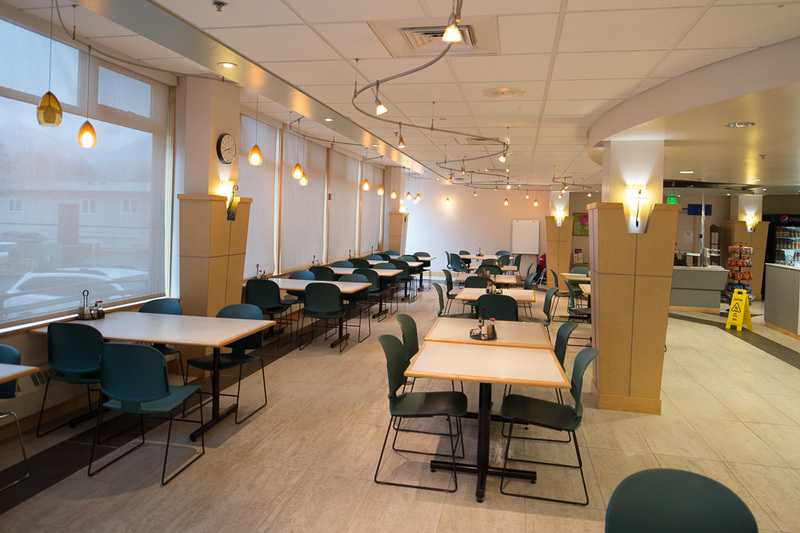 On the first floor of the facility, power, lighting and data were provided for a reception area, resident dining area and kitchen, as well as dental and medical clinics. Lighting for the first floor utilizes the same LED junction box mounted LED downlights as well as 2×2 recessed LED troffers. 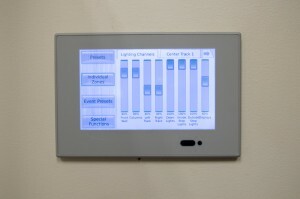 Controls for the lighting utilize wall or ceiling mounted occupancy sensors and in some rooms wall dimming switches. Security design for this facility included cameras and an access control system. 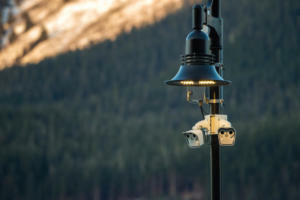 Security cameras with day and night monitoring were mounted to the exterior of the building to record activity in the parking lots and the building entrances. 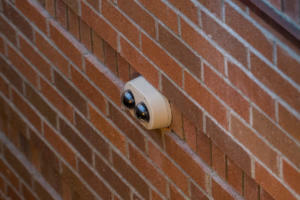 Wall mounted and 360-degree cameras were designed for the interior to monitor the corridors, entrances and dining areas. The main entrances are equipped with card readers and ADA door openers. 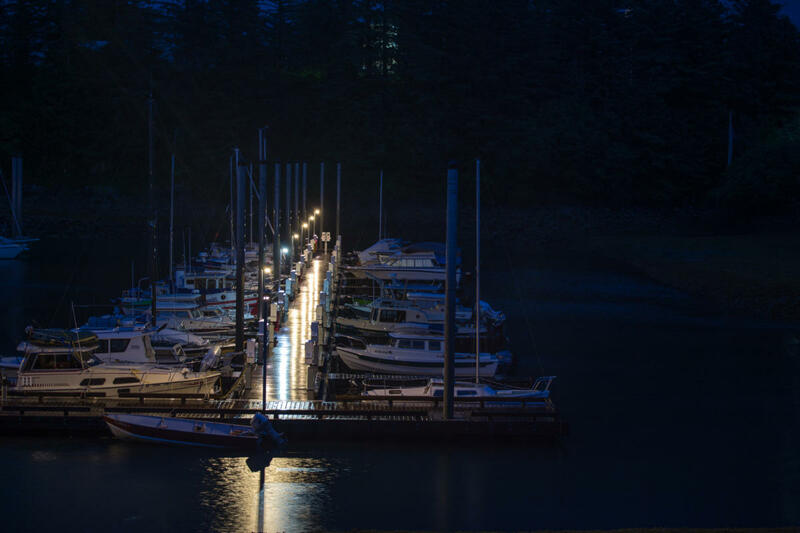 In 2015 Haight & Associates was asked to provide a design for new power and lighting for Douglas Harbors A, B and C floats. This included providing new uplands switchboard and dock mounted service equipment and metering. 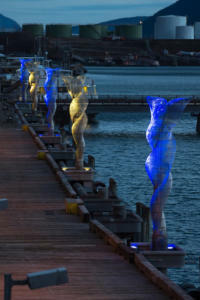 Lighting for the new floats, head walk and gangway was provided using all LED lamp source. 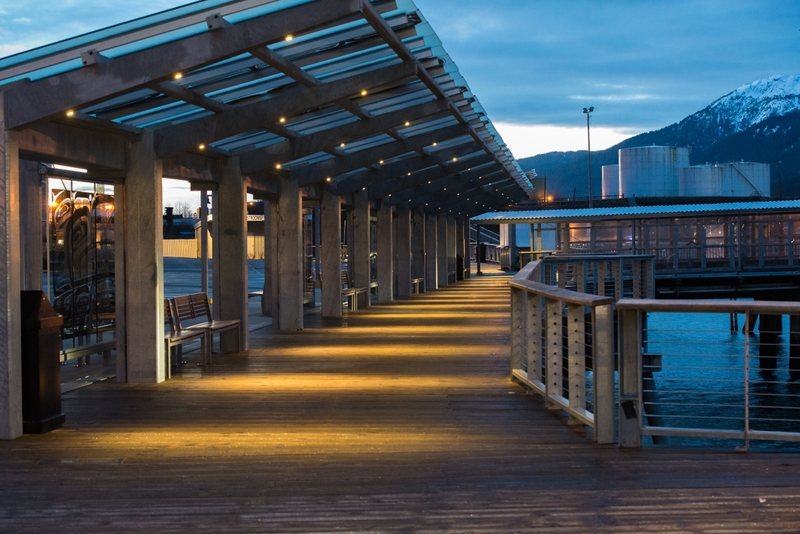 The gangway lighting consists of a small canopy mounted linear LED strip. 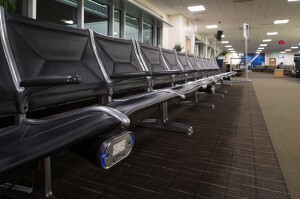 Remote electronic drivers provide power to the LED strips. The head walk is illuminated using pole mounted area lights with a Type I distribution, to put the light on the dock surface and reduce glare on the water. This same type of luminaire was use on the floats, mounted to the power pedestals. 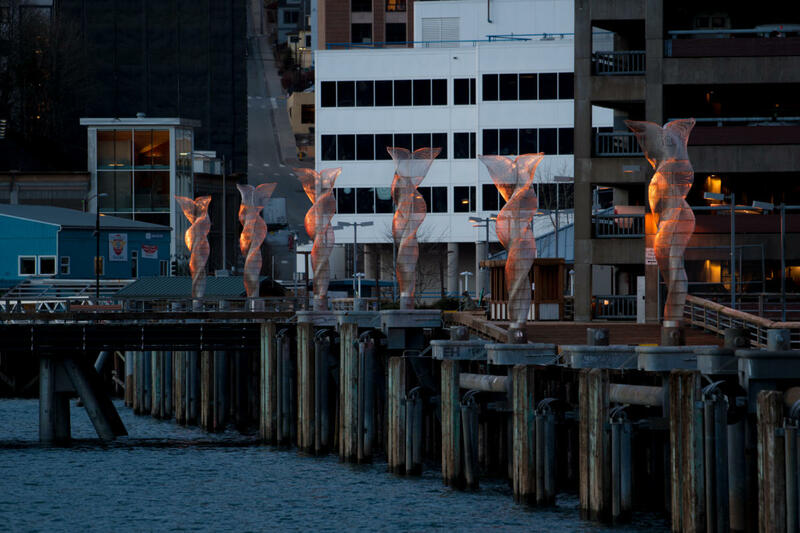 Diffused lenses were specified to help reduce glare. Controls for the lighting consist of photoelectric cell and lighting contactor located in the switchgear. Power is provided to the shore-tie pedestals with type W cables installed in fiberglass cable trays beneath the deck boards from the switchgear. Each powerhead is equipped with a utility meter, receptacles for shore tie power, and circuit breakers. 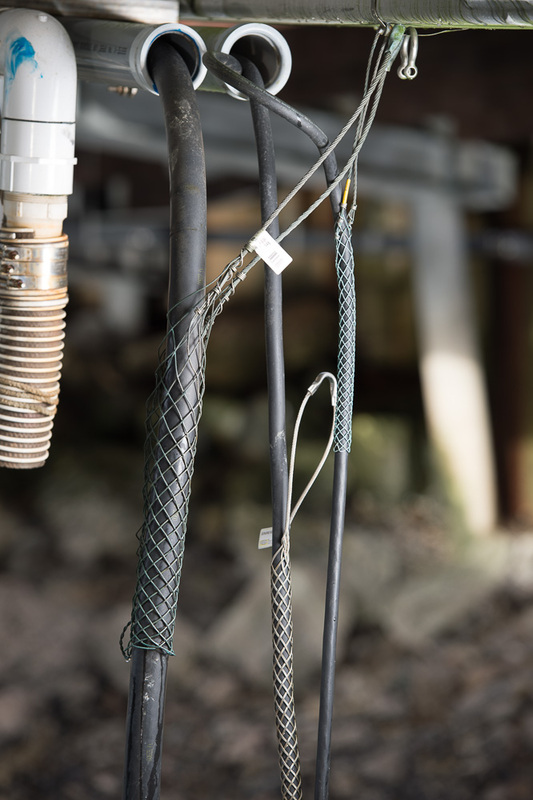 Ground fault protection is provided with GFCI type circuit breakers in the shore tie powerheads set to trip with a ground current exceeding 30mA. Ground fault relays operate shunt trip type circuit breakers on the feeder circuits in the switchgear. HAI is currently working on replacement of the dual medium voltage feeders from the utility with their transformers contained in a vault inside the building on the seventh floor. The transformers are oil cooled with an output of 480y/277-volt power to the building distribution system. HAI’s design involves determining locations for the transformers and switchgear, the types of transformers, and a construction methodology to complete the equipment and circuit replacement while retaining power to the building. HAI have completed the load analyze, preliminary design, design development and completed with contract documents. HAI was also involved in bidding process and bid review. Currently project is in early stages of construction. In 2017, the Ketchikan Airport Rescue and Firefighting (ARFF) building was renovated to provide a functional facility for the storage and maintenance of firefighting and rescue vehicles. Haight & Associates designed the power distribution, LED lighting, networking and fire alarm systems. 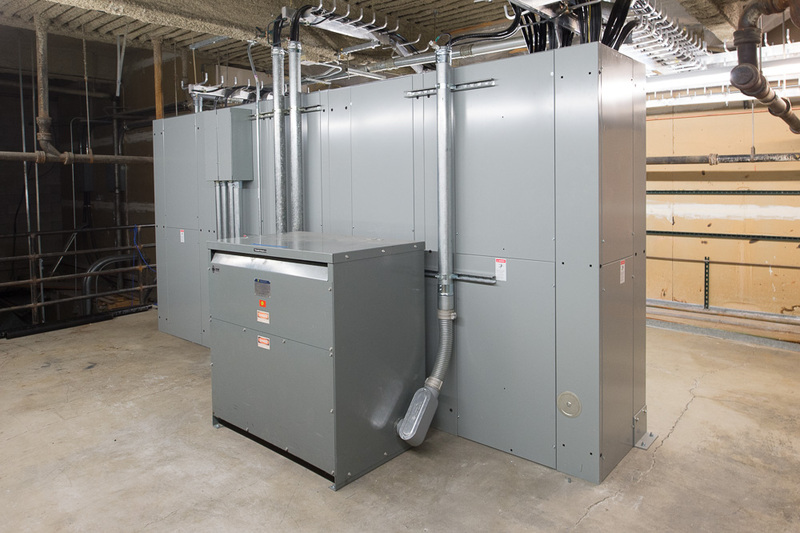 The power distribution system provides power for convenience receptacles, drop cord receptacles, engine block heater receptacles, kitchen appliances, air handling devices, and hydronic heating devices. 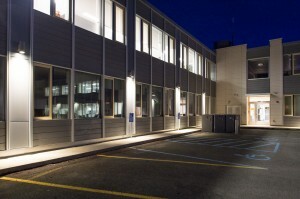 The LED luminaires were designed with integral emergency batteries for egress lighting . 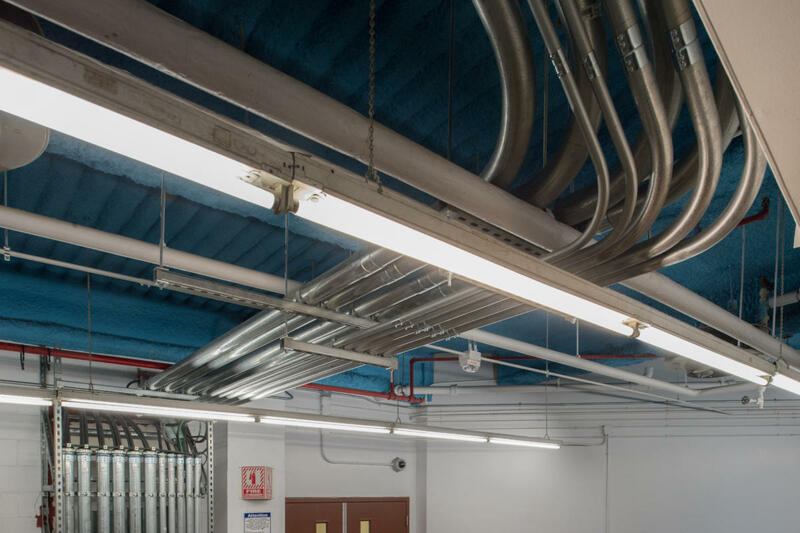 The lighting controls utilize manual wall pods in the equipment and maintenance areas and occupancy sensors in the offices, restrooms, and storage areas. New Cat5e cables with RJ45 ports provide a new data network to satisfy the maintenance staff’s computer needs, and a new fire alarm system was designed for the building to be NFPA code compliant. A new standby power system was designed by Haight and Associates for a community center in the town of Saxman, adjacent to Ketchikan. The community center serves as an emergency shelter in the case of a natural disaster. 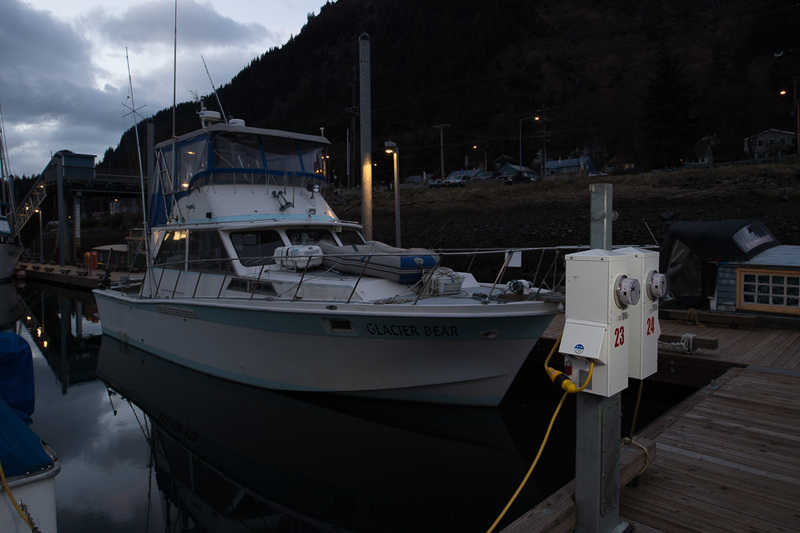 The newly installed standby power system will provide the residence of Saxman powered, heated shelter in the eventuality of a power grid failure. 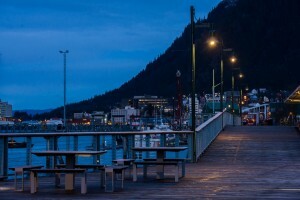 This may be of particular importance there due to the precipitousness and cold temperatures that are typical in the Tongass National Rainforest. Haight & Associates designed the electrical systems for new corrections offices in an existing building. As-built conditions were noted on electrical drawings and devices relocated or added where new walls were added or removed. 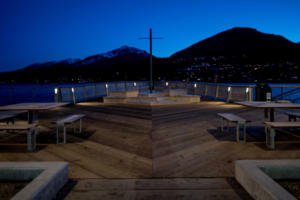 The goal of this project was to reuse existing lighting as much as possible and only provide new lighting if necessary. Existing 2×4 recessed lensed fluorescent troffer and surface fluorescent wraparound luminaires were relocated where new walls were added. 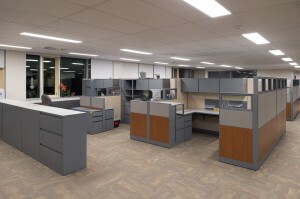 New lighting controls were added where necessary to allow occupants better control of individual offices and common spaces. 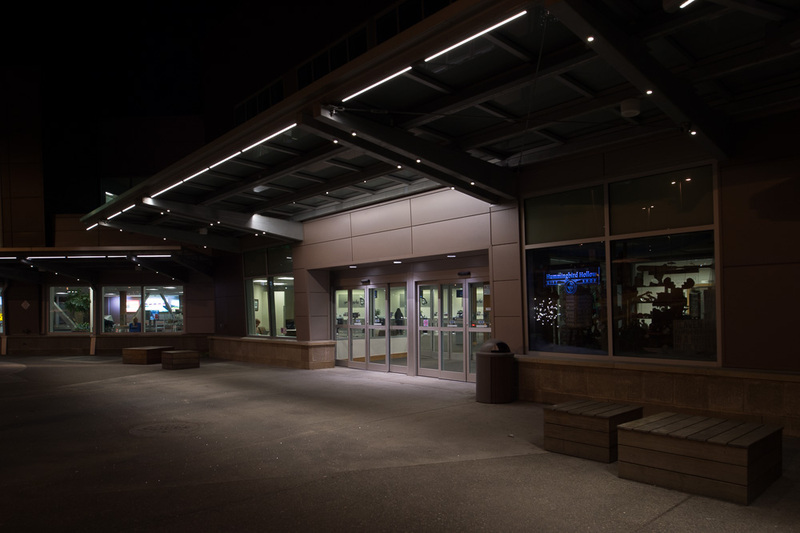 A few new exit signs and battery backup emergency lighting were also provided to comply with building egress codes. 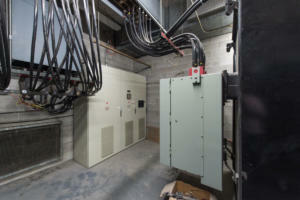 Haight & Associates was asked to provide electrical design for the hotels remodel of the 2nd and 3rd floors. Haight & Associates main focus was to provide power to complete hotel kitchen and Bar equipments. During our final portion of the design, we went back redesigned all the rooms to make the bed rooms bigger. 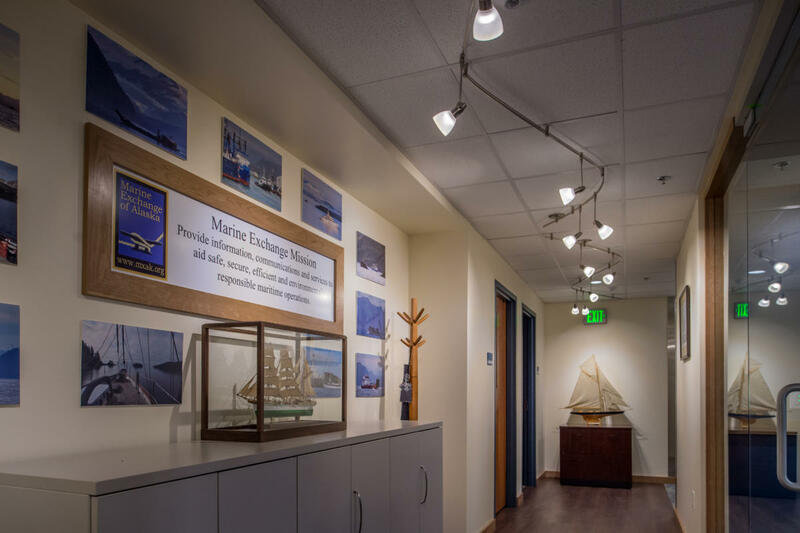 It was challenging yet rewarding experience for Haight & Associates. The lighting design challenge was to provide low cost, energy efficient lighting, while making the spaces feel warm and inviting to guests. For the corridors junction box mounted LED downlights were placed in front of guest room doors, and decorative LED wall sconces were spaced along one side of the corridor. The entries to the guest rooms and suites were lit with a surface mounted LED drum style, and junction box mounted LED downlights were placed in front of closets and kitchenettes. In addition a switched outlet was provided for table lamps next to the bed. Lighting controls provided for the guest rooms and suites are toggle on-off style to control the entry, closet, kitchenette and bedside table lamps separately. The bathroom lighting is controlled by wall switch occupancy sensors. 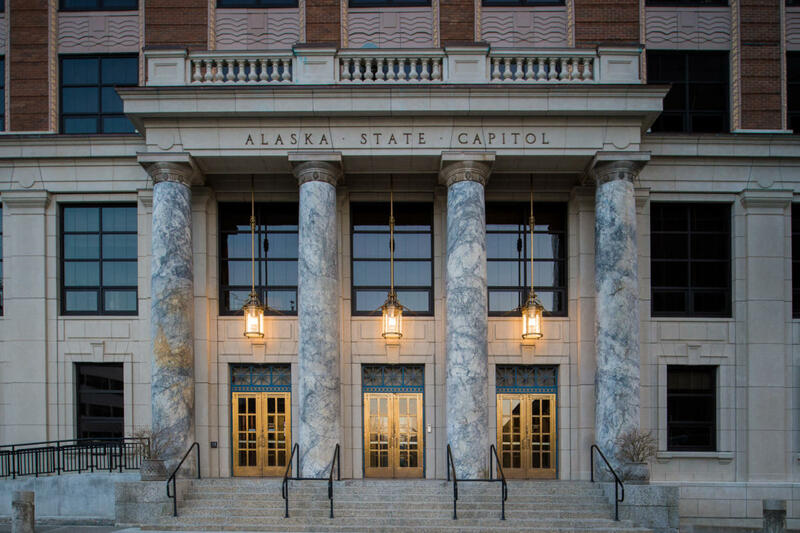 In 2016, Haight & Associates was hired by the State of Alaska to design the renovation of the service and standby power equipment for the Capitol Building in downtown Juneau. 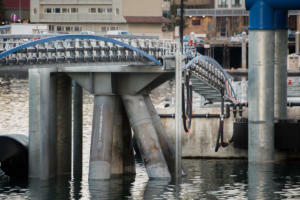 This design has yet to be utilized for construction. 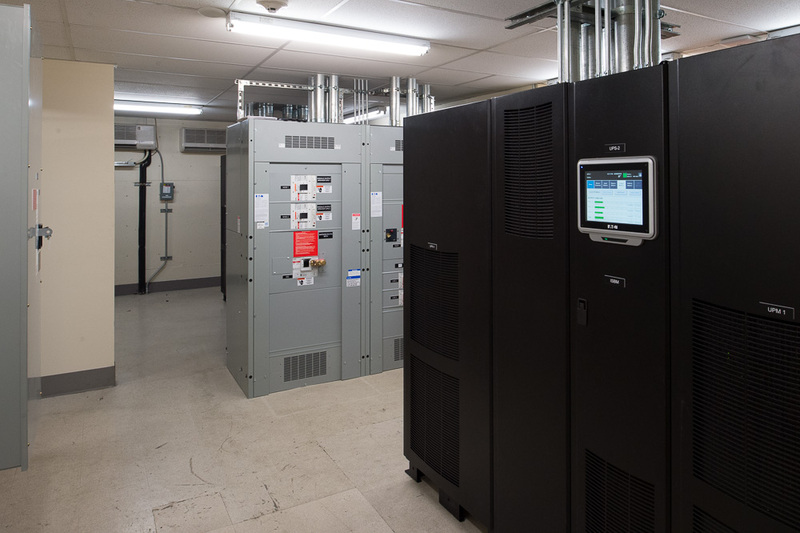 Presently, the Capitol service equipment is a complex switchboard inside the building with multiple service disconnects, many feeder circuit breakers, four automatic transfer switches (ATS), and a single 300kW generator. 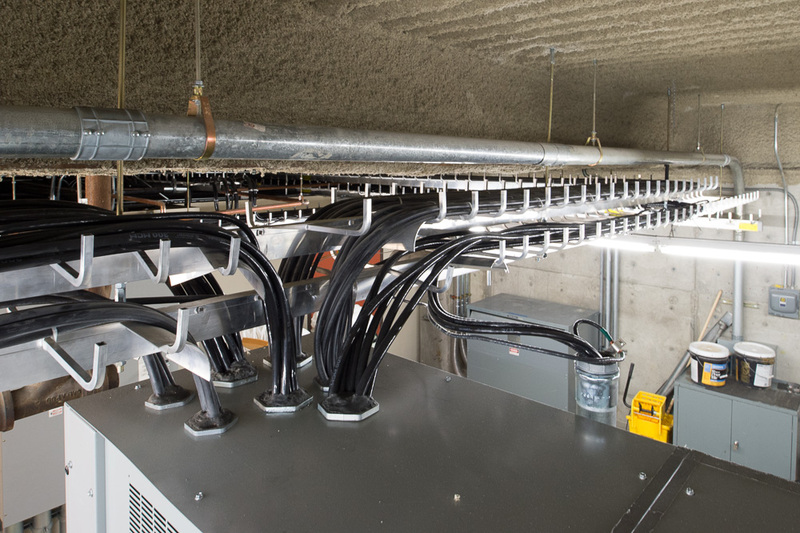 The service switchboard is supplied by a bus duct installed in the Capitol Building basement. 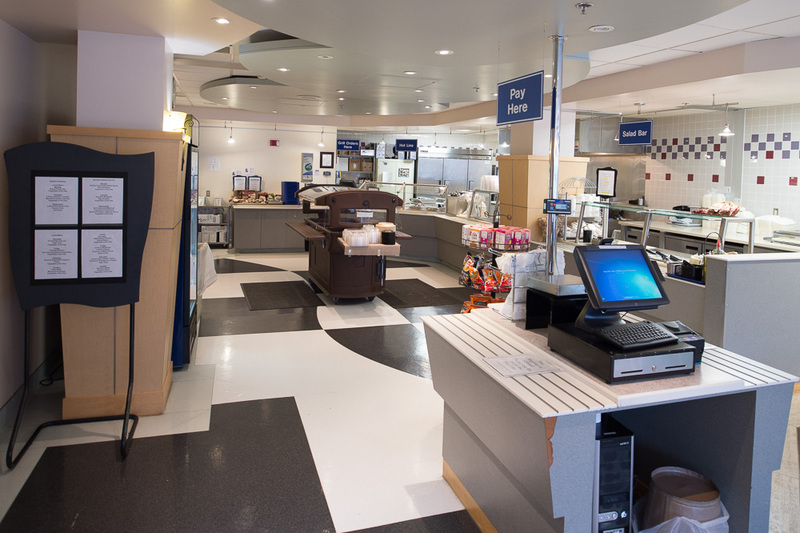 The renovated service was designed to be simpler and code compliant. The new service circuit breaker, current transformer cabinet and utility meter were designed to be located in the building courtyard. 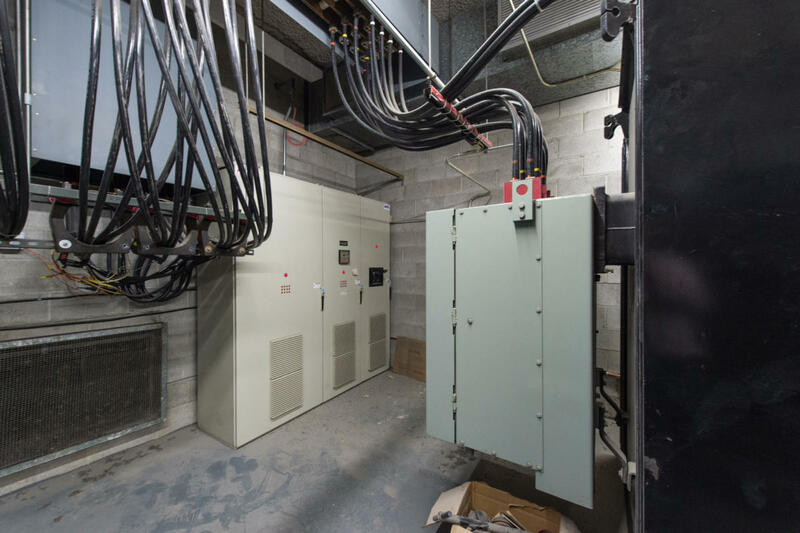 All existing transfer switches were designed to be removed and replaced with a single ATS, integral to the new switchboard and fed from the existing 300kW generator. The new switchboard would replace the existing service equipment and house the new feeder circuit breakers and customer metering in addition to the transfer switch. 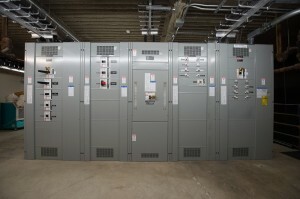 All existing panels and loads were designed to be fed from this new switchboard. In 2015 HAI provided an assessment to upgrading, replacing, renovating the standby emergency generators at the State Office Building. 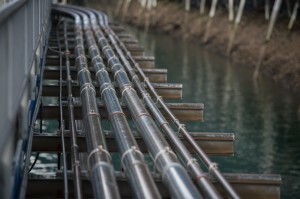 Assessment included evaluation of the present system and conditions, review of code requirements, determination of loads and options for siting and interconnection to the power distribution system. 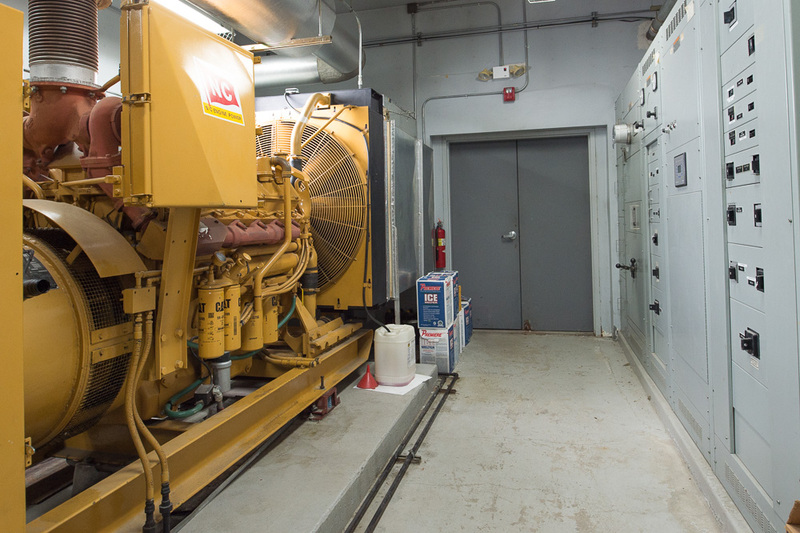 In 2016 HAI provided professional signed drawings for decommissioning in place of the old generator (500KW unit), reconfiguring the existing generator (900KW), and configuring a new generator (800KW unit). HAI assisted the owner through bidding question, submittal approvals and provided conformed drawings. In 2017 HAI provided electrical construction observation services including off hours extended administration, on site inspection during install, commissioning new generator, and bringing power back on to one breaker at a time. 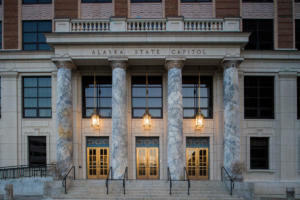 HAI’s one and only goal with all the other goal was to keep the power ON to the Alaska’s main data center that is located inside the State Office Building. HAI had done a beautiful job with the help and support of a great electrician team and the owner. 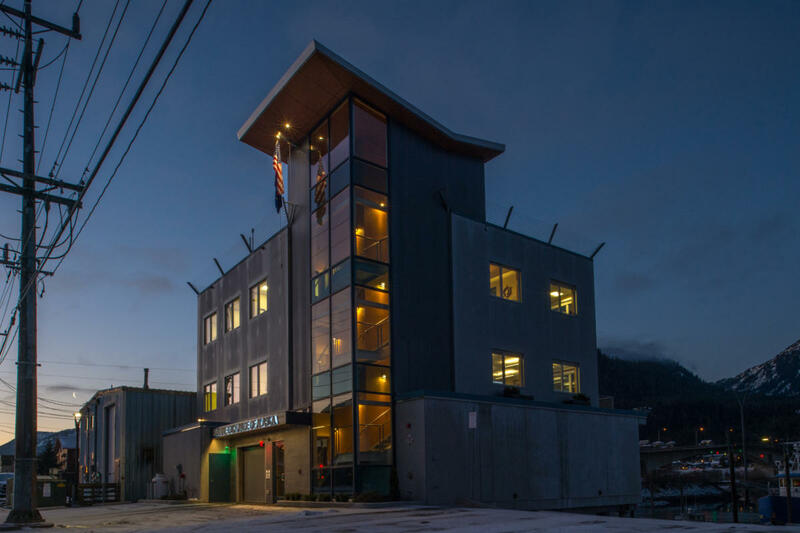 Haight & Associates were pleased to be able to work with a local architect to design electrical systems for a 7 unit affordable housing complex in Ketchikan. Each unit includes a kitchen, dining, living room, and bathroom as well as a laundry area. 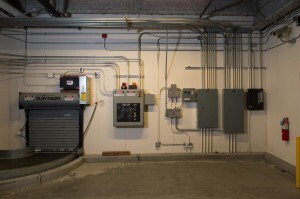 Haight & Associates electrical plans show power to receptacles, appliances, baseboard heating and lighting. 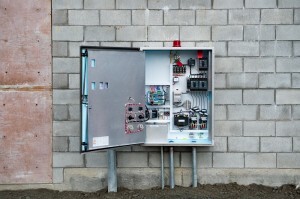 Also included in the design was a new utility transformer with a meter pack to provide separate metering for all the units. 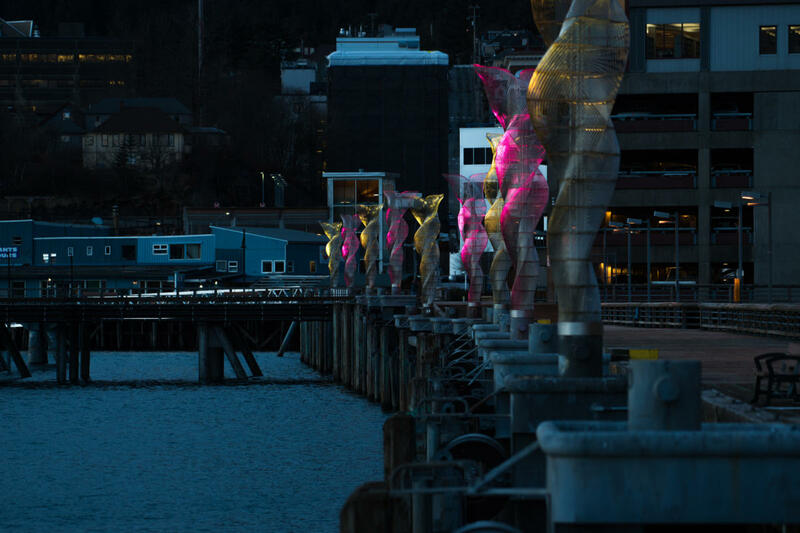 The goal for the lighting design was to keep it affordable and require less maintenance. 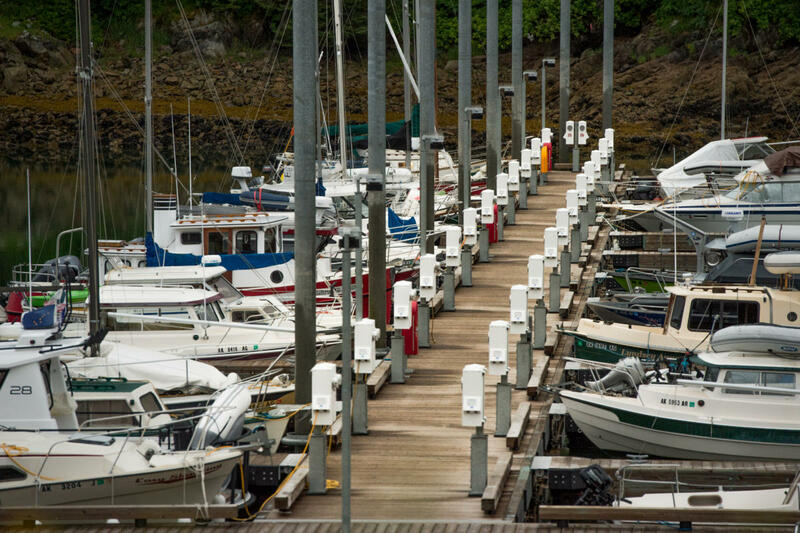 Low cost LED junction box mounted downlights were used predominantly throughout. 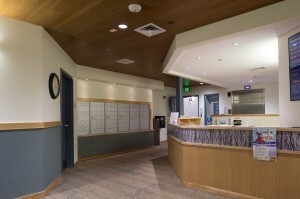 Other residential style lighting was also provided to give the units an inviting atmosphere. 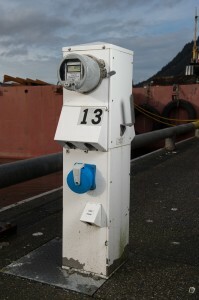 Single pole or three-way toggle on-off switches were provided for lighting control. A split duplex receptacle in the living room is controlled with a single pole toggle on-off switch to control a floor or table lamp. 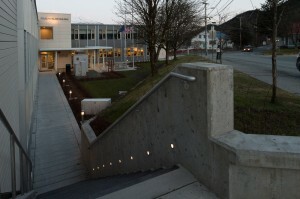 Exterior wall sconces were placed to highlight entries, and a few pole mounted area light were located to illuminate the sidewalks and parking areas. 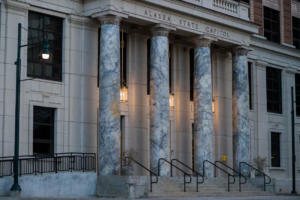 The light poles were custom designed to provide banner arms, planter box hangers, and receptacles for holiday lighting. 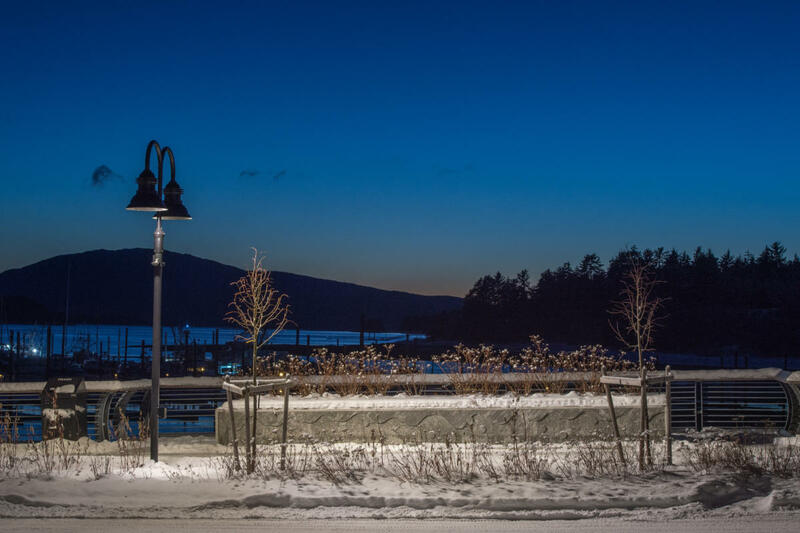 The luminaires are mounted on four-foot arms, with the bottom of the light fixtures hanging fifteen feet above the sidewalk to prevent damage from large vehicles. 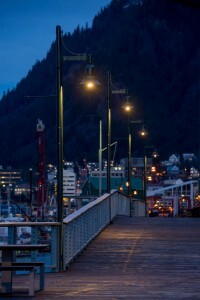 Low-profile LED strip lights were designed for the canopies of local businesses on the sea-side of the streets. 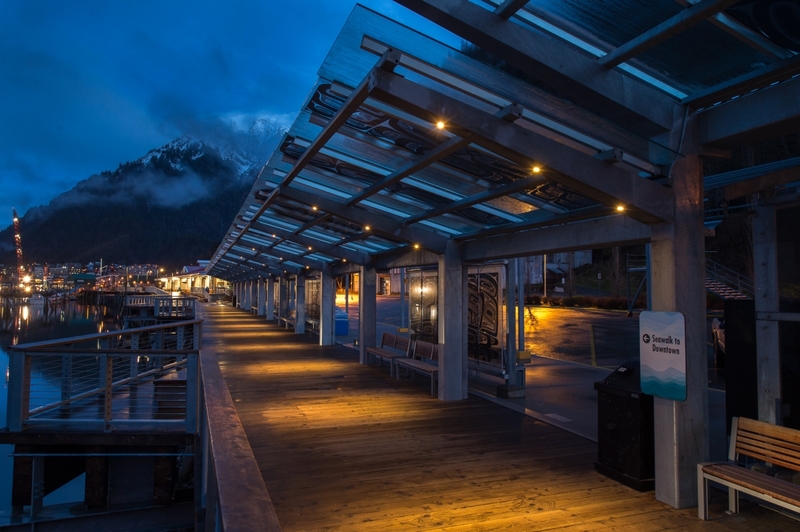 Each business canopy is equipped with a dedicated LED driver to separate the branch circuiting from adjacent canopies for ease of maintenance. 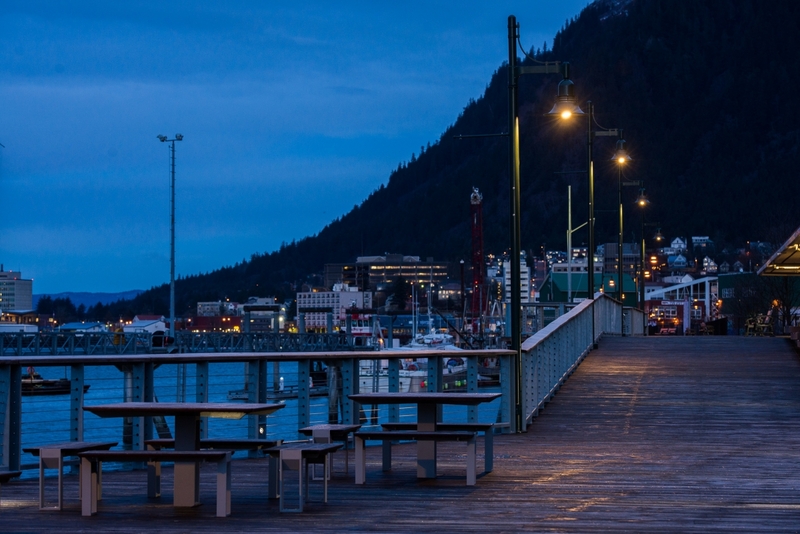 Haight & Associates will continue to design new LED lighting for the renovated streets and sidewalks of downtown Juneau as the renovation continues into future phases. 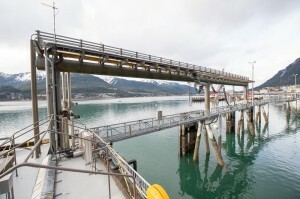 Haight & Associates is licensed and insured to provide engineered designs for grow facilities in the state of Alaska. We have provided permit drawings for small businesses intending to grow, harvest, process and sell marijuana. 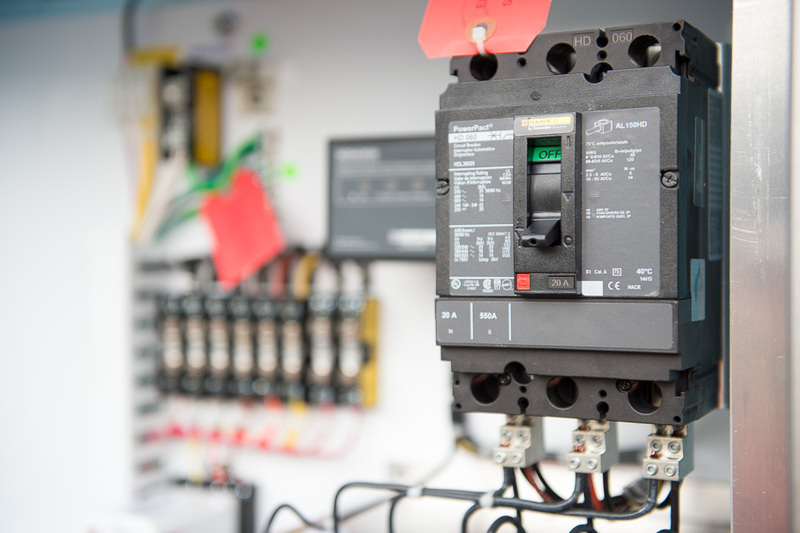 Our permit drawings provide load analysis, single line diagrams, panel schedules and floor plans for new or renovated electrical systems, including power, lighting, fire alarm and low voltage. 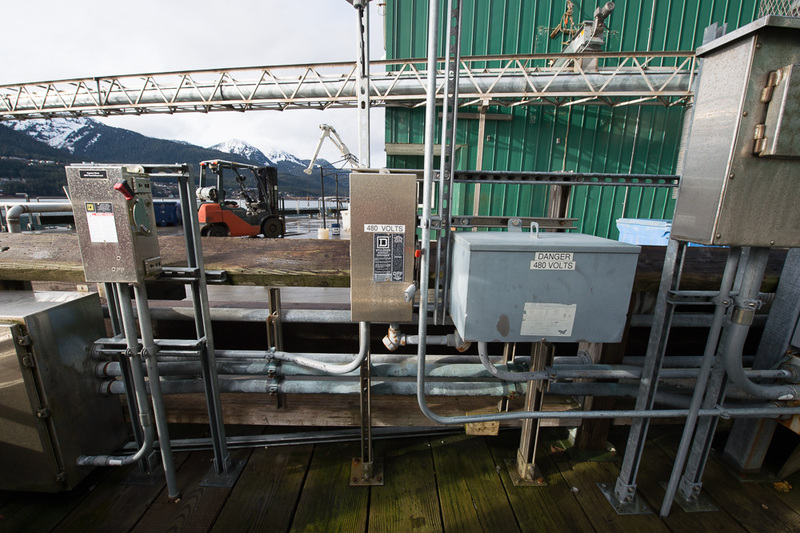 Existing grow facilities built with HAI permit drawings include Fireweed Factory, Green Elephant Gardens, Green Escape and Rainforest Gardens among others in Southeast Alaska. Sealaska Heritage Institute is a three-story building with basement includes electrical support for HVAC and pellet boilers as well as distinct lighting, UPS, IT rooms, access control and life safety systems. With the construction of the new building, PDC, Inc. and Haight & Associates designed lighting, power systems, configuration of the lighting controls, network & communication infrastructure, fire alarm system, access control, and security system. 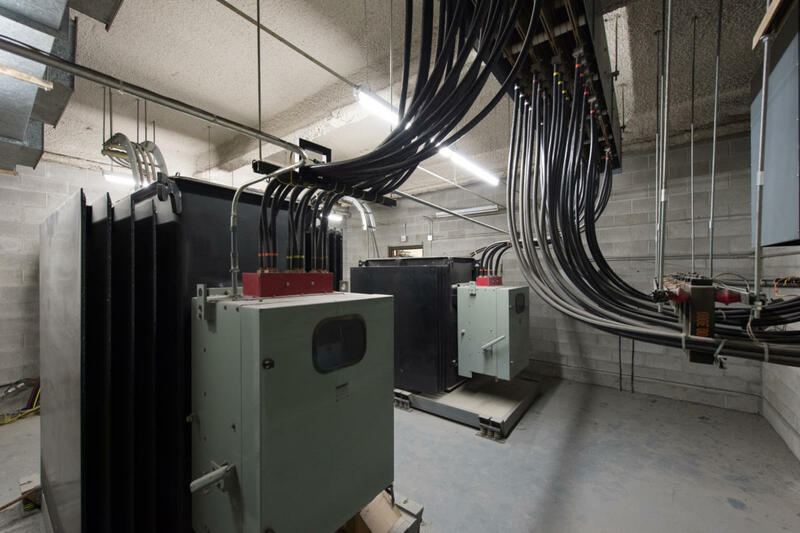 AEL&P provides secondary service 208V 3 phase power underground from their vault to the switchboard in the basement Mechanical room. 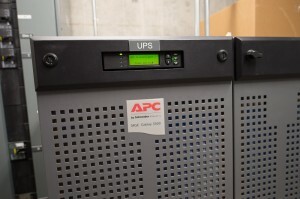 IT rack and AV controls are connected through an UPS providing 18 to 20 minutes of back up power for a safe shutdown. The fiber optic (backbone) cable from the Sealaska Plaza network addressed with the communications systems facilitates the interconnection between the Sealaska network and the Sealaska Heritage Institute network. 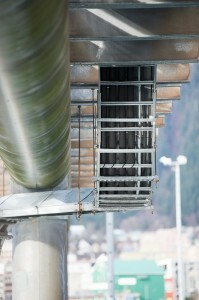 There is a cable tray system on each floor with an optimal integration with raceways to the terminals. 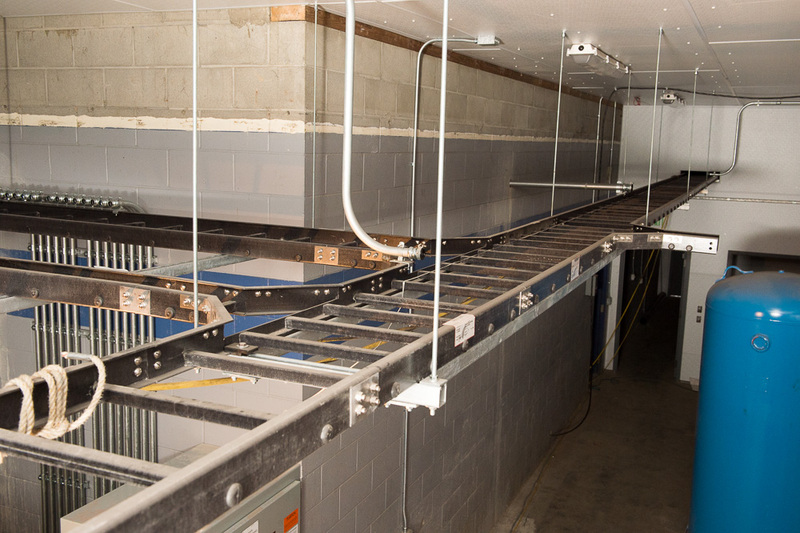 The cable trays utilize a mono-rail, aluminum construction suspended from the structural ceiling. 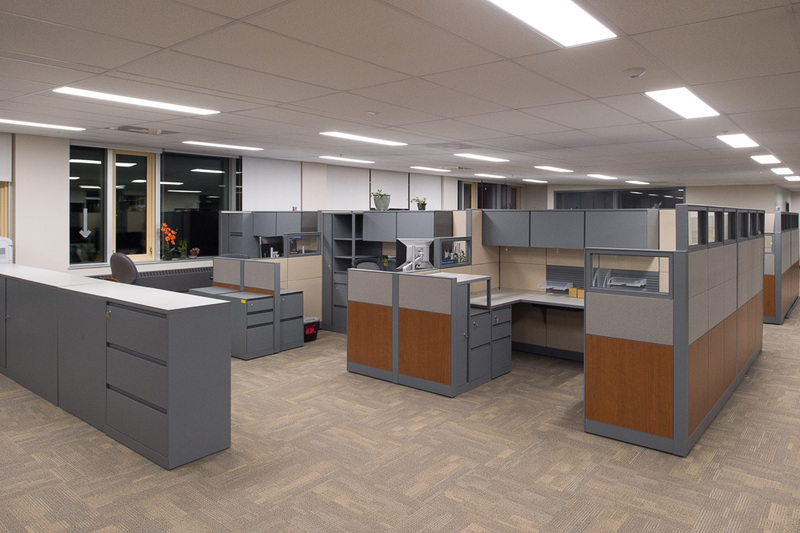 Lighting throughout utilizes LED sources, with a combination of lay-in troffers, recessed can lights, and specialized track and display lighting utilizing directional heads and pendants. 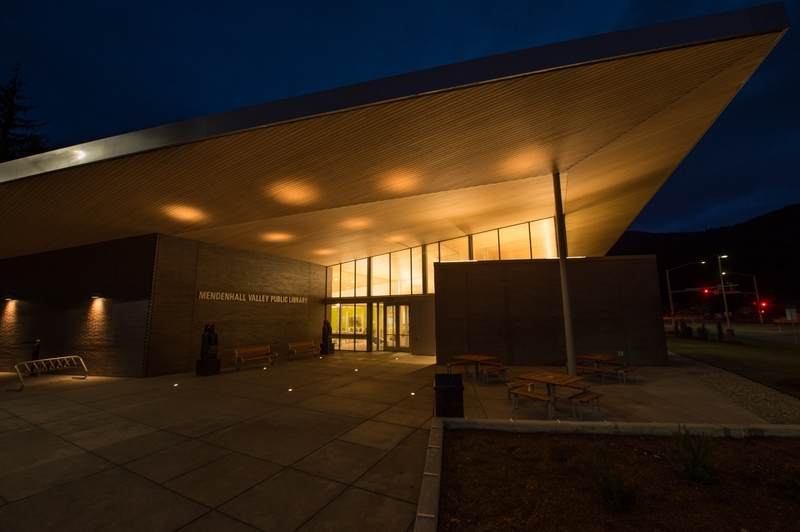 Exterior canopy and façade lighting uses well controlled LED optical systems for control of lighting within the tight property lines while maintaining appealing entries and highlighting the artwork around the entry. 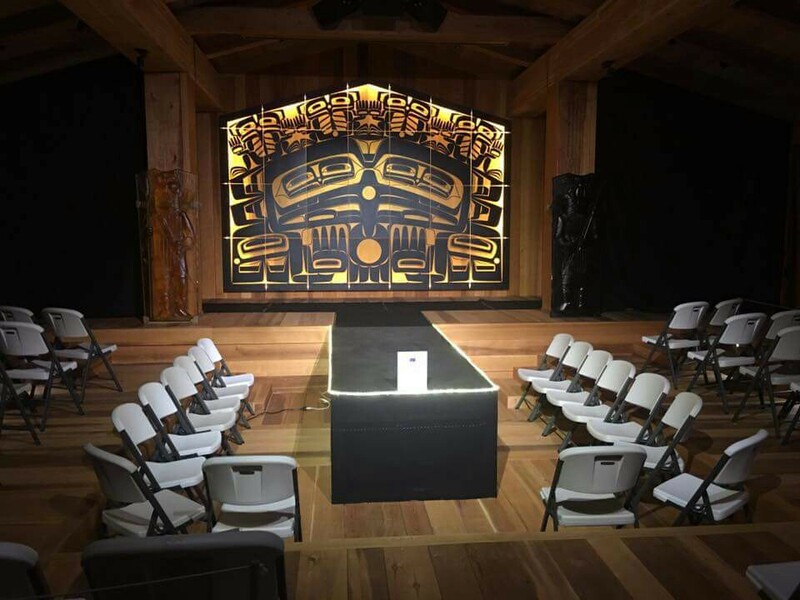 Interior theatrical lighting uses LED fixtures to greatly reduce the electrical and associated cooling loads within the Ceremonial hall. 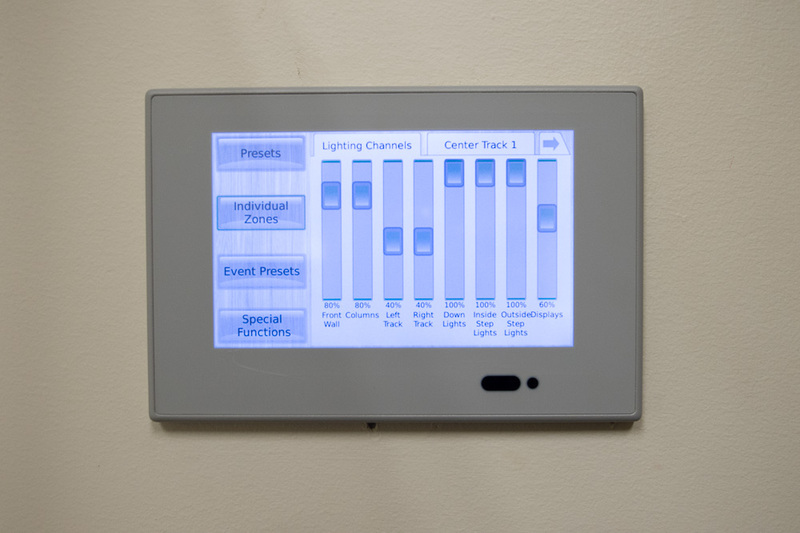 Lighting controls involve motion sensing type devices, either occupancy or vacancy sensors in smaller rooms, theatrical lighting system and multi-zoned display. 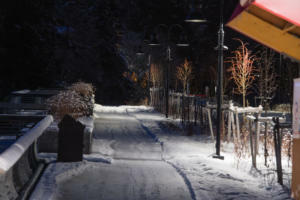 Some areas with more complex illumination elements will involve low voltage control stations and motion sensing devices. Rooms with good exposure to natural light will incorporate daylight sensing and dimming control. 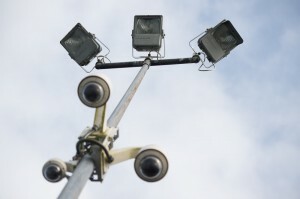 Security surveillance system is Ethernet based, utilizing the network system. 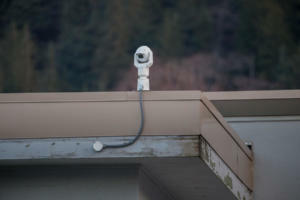 The server will collect video streams and images as specifically programmed for each camera. The programming will allow for continuous streaming, scheduled periodic image collection, and image collection or streaming with motion sensing. Clan House at Sealaska Heritage Institute has LED back lit glass panel. 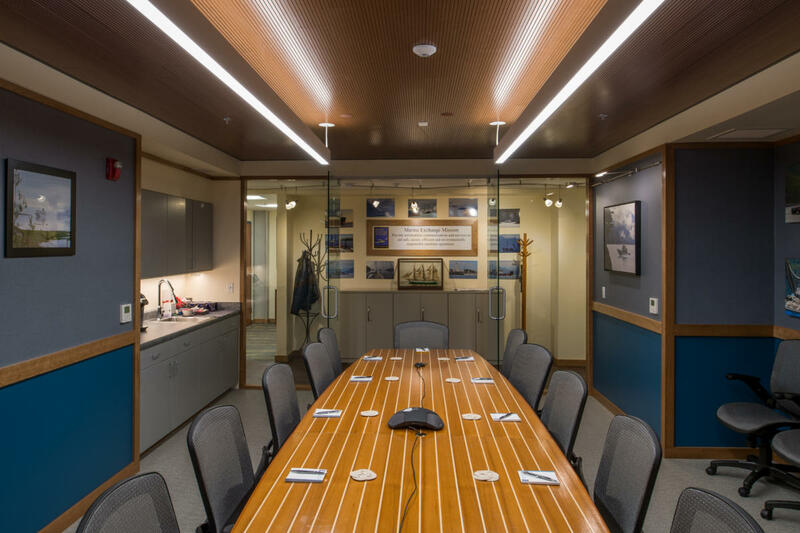 Lighting of the Glass Panel is designed and configured by HAI employee Ms. Nimmy Philips and the wood work behind the glass panel was constructed and designed with the Carpentry skills of HAI employee Mr. Robert Jensen.